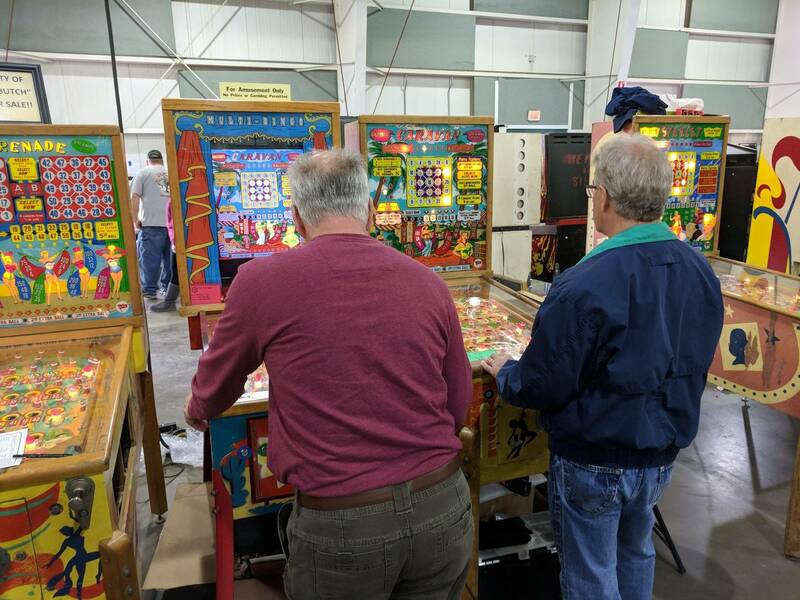 » Forum » Electro-Mechanical » EM Bingos » Bingo Row at the 2018 York show! 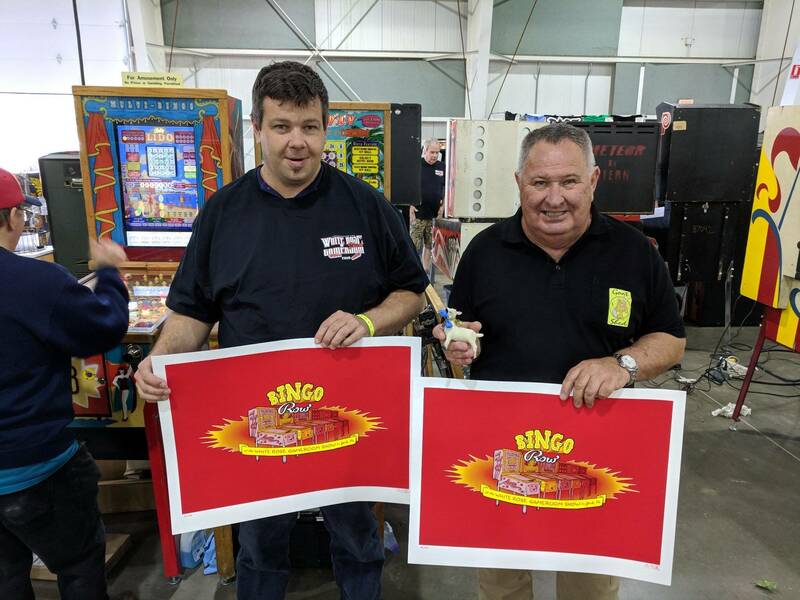 » Bingo Row at the 2018 York show! 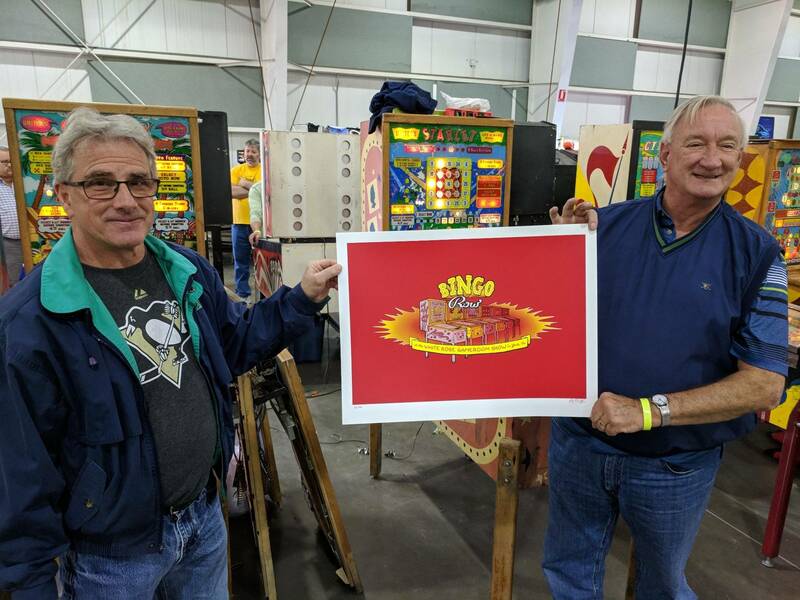 Bingo Row at the 2018 York show! There have been 113 images uploaded to this topic. (View topic image gallery). 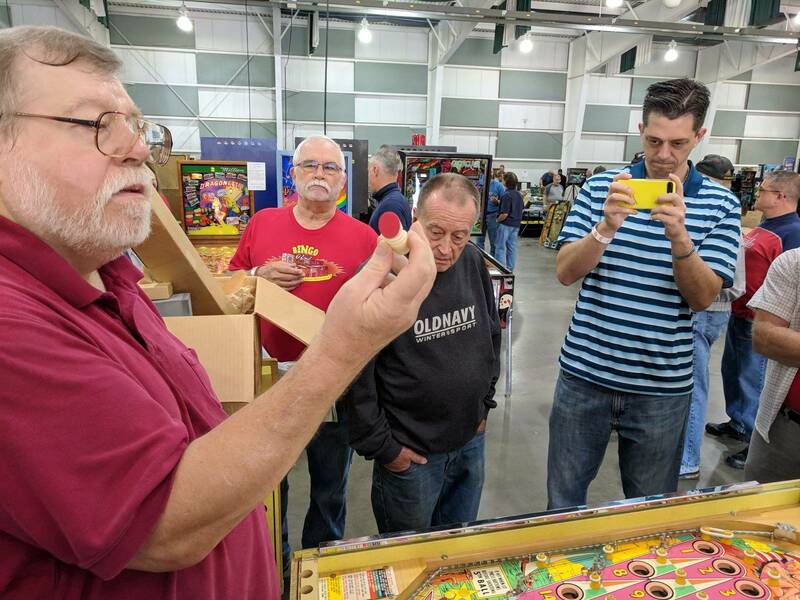 This is the fourth year that bingo pinball collectors from all over are coming together and bringing games for the public to play at the annual White Rose Gameroom show in York, PA! 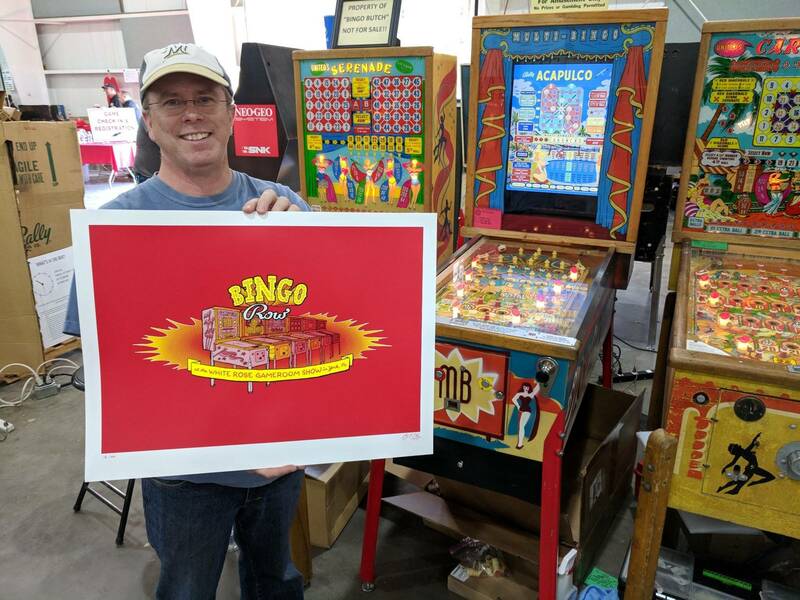 I am bringing two games - the Multi-Bingo, which has 142 different games, as well as three playfields - a standard 25 hole playfield which plays 105 different games, a 20 hole playfield, which plays another 16, and a 28 hole playfield, which plays an additional 2. United Caravan is also coming with me. 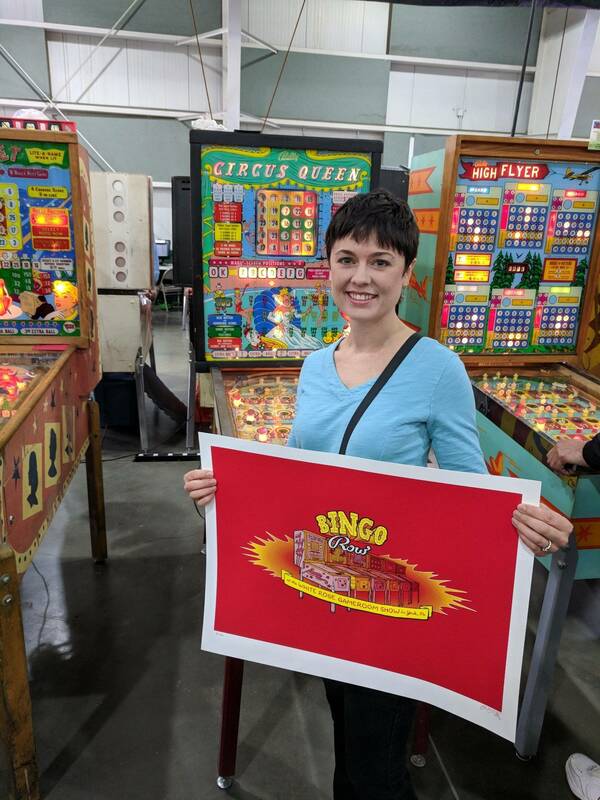 I am looking forward to seeing my bingo friends again, and playing a variety of beautiful games. 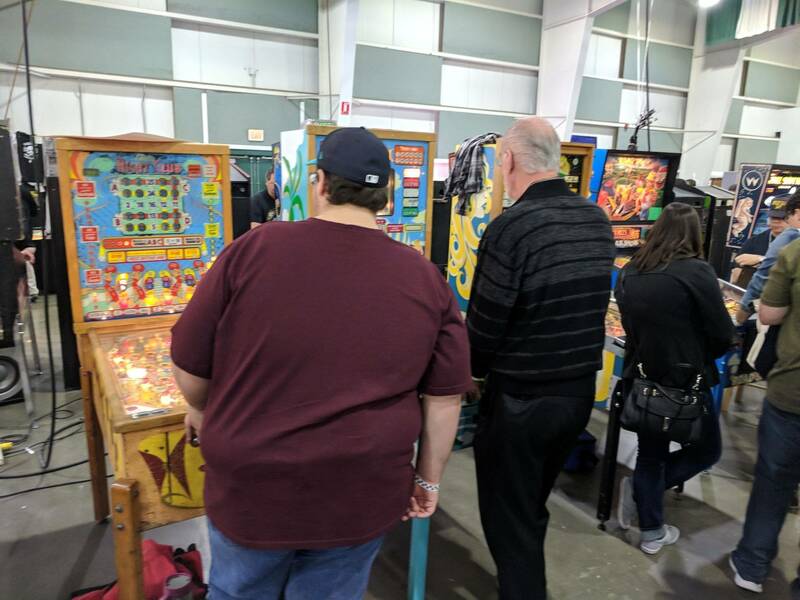 Come say "Hi" and try your hand at these great games. 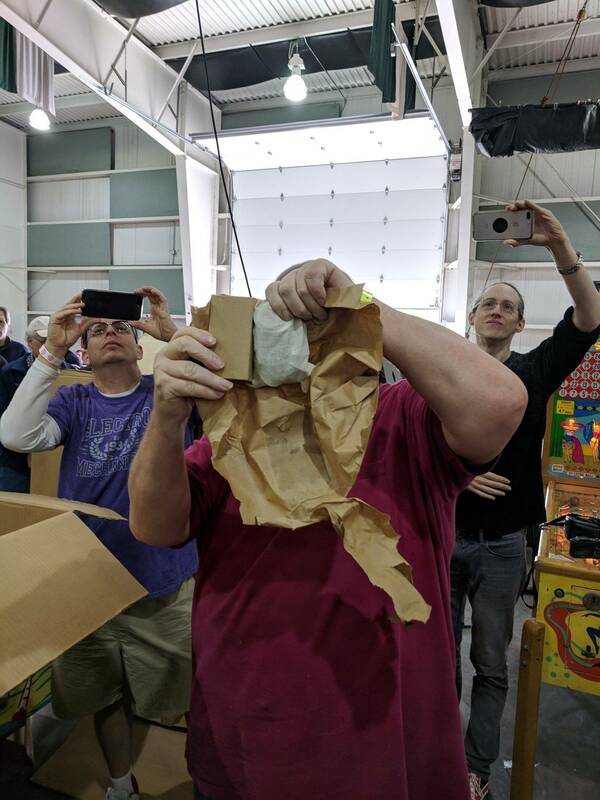 bingopodcast I understand the unboxing is being streamed live. How do we view that? 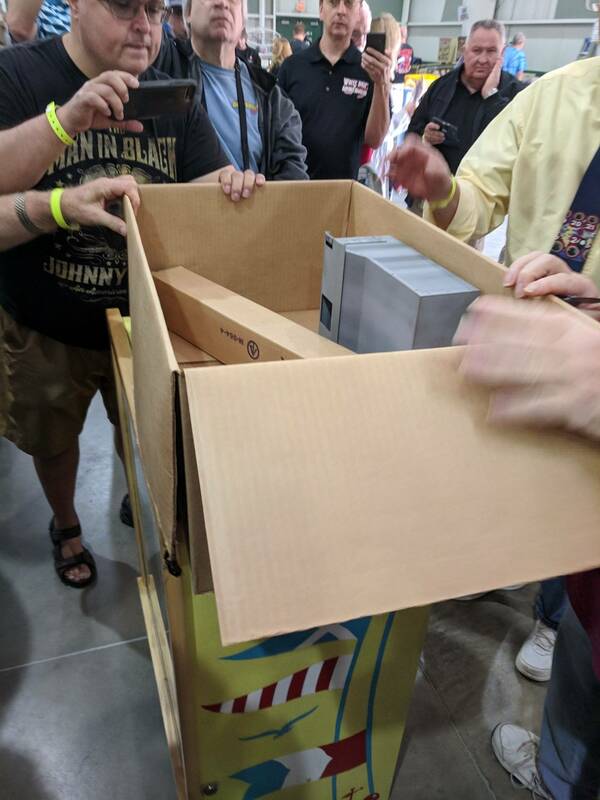 Can't wait to see the unboxing of this game. It was on the White Rose Gameroom show's Facebook page live. Should still be viewable. Had many people take photos and video. 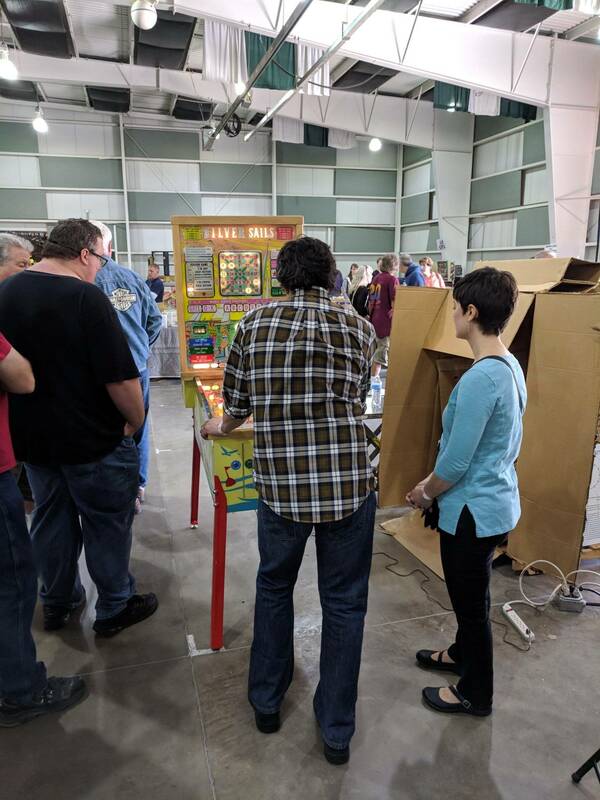 People are playing it and all is going well! 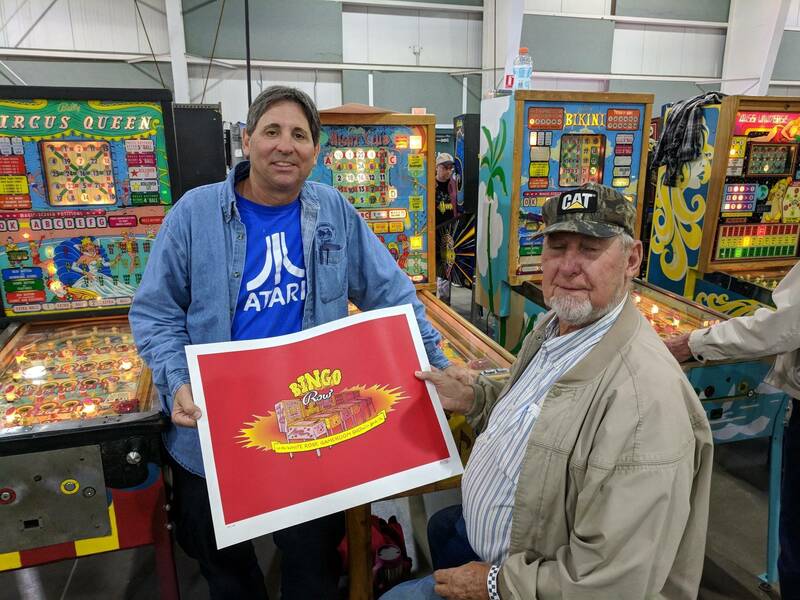 Bingo row was great as always. 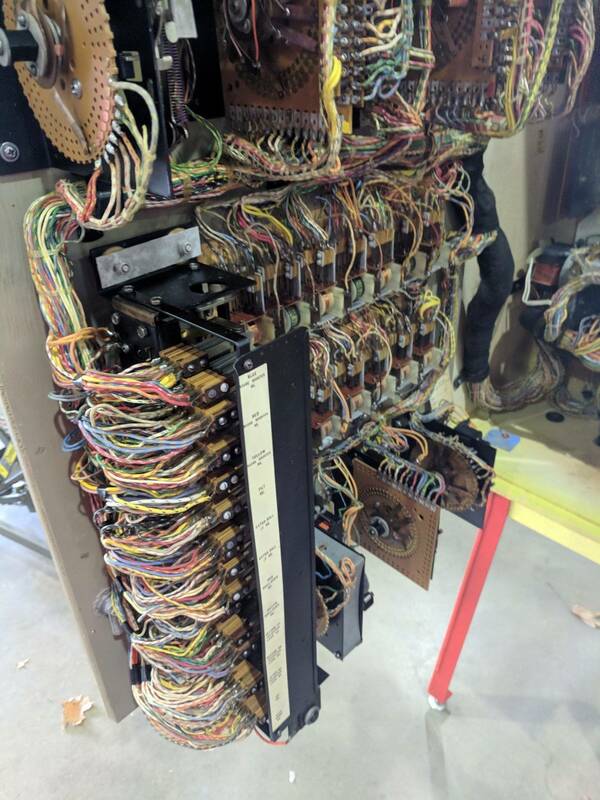 Only problem is that i cant bring myself to shake someone else's 50 year old machine to ever do well. 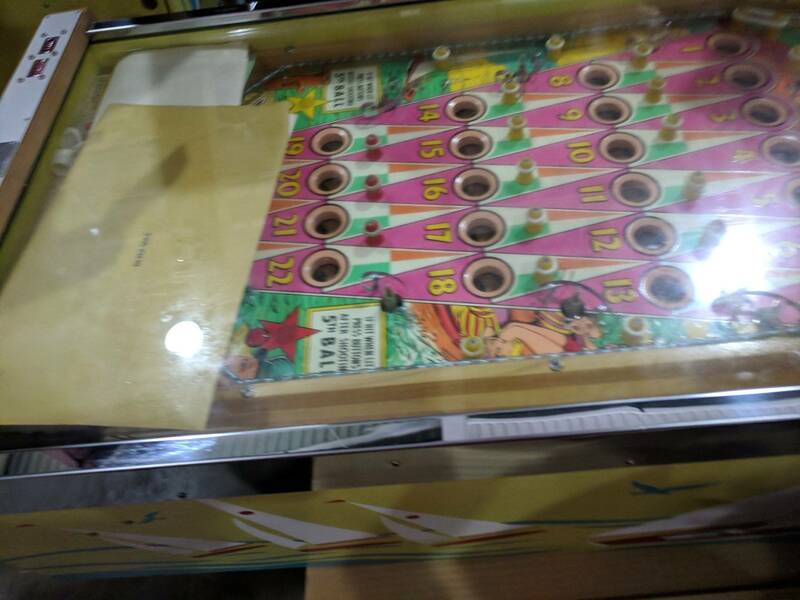 The nos machine was beautiful and had tbat new game smell tbat i cant describe. 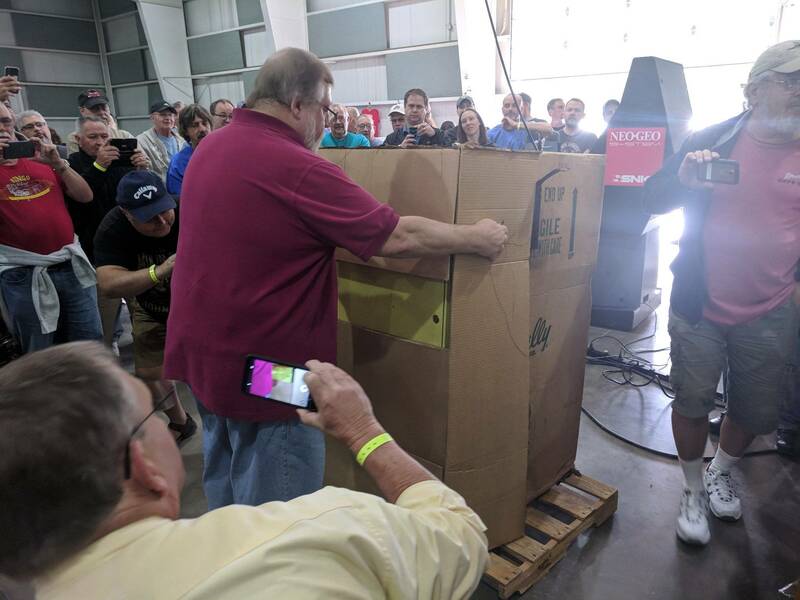 The unboxing was the center of attention on Friday. Amazing to see a brand new game that is that old. Wow! What an amazing show! I'm unloading today, and will post updates as soon as I am able. This is the first year I’ve ever really tried the bingo pins. I gotta say I loved them after someone taught me how to play! Now I just gotta get on board with owning something EM when I only fix SS stuff! United's Serenade, the only one known of its kind. It has a two card layout, but you can only select one card or the other. Thanks to Butch and Mike for bringing this gorgeous machine. 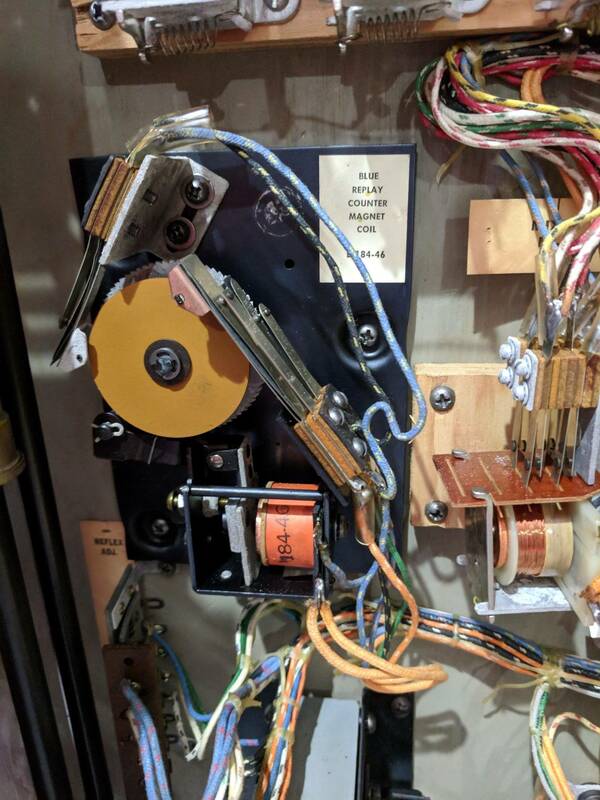 The machine was a sample, and had multiple meters installed to track various items. 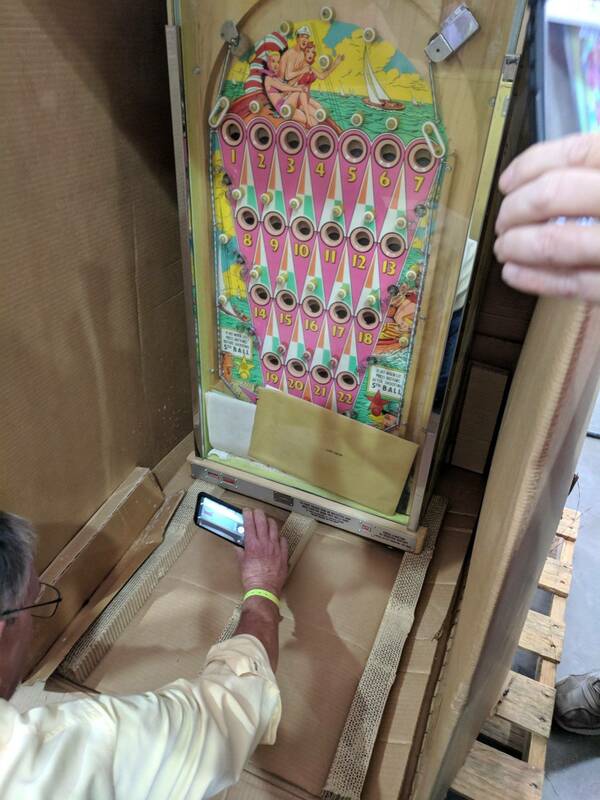 The Multi-Bingo - a one-of-a-kind machine that I created that can play all 142 bingo pinball machines in a single cabinet. 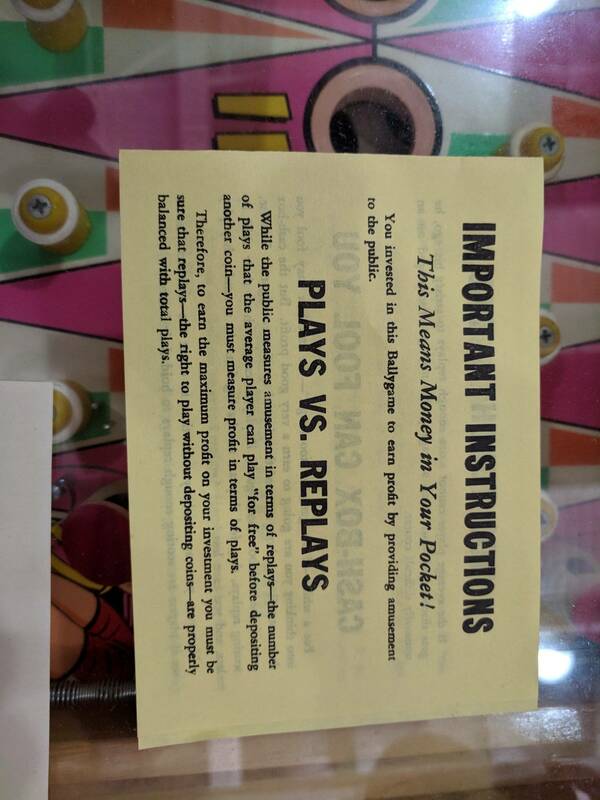 I brought two additional playfields, but did not have time to swap them into the game during the show. 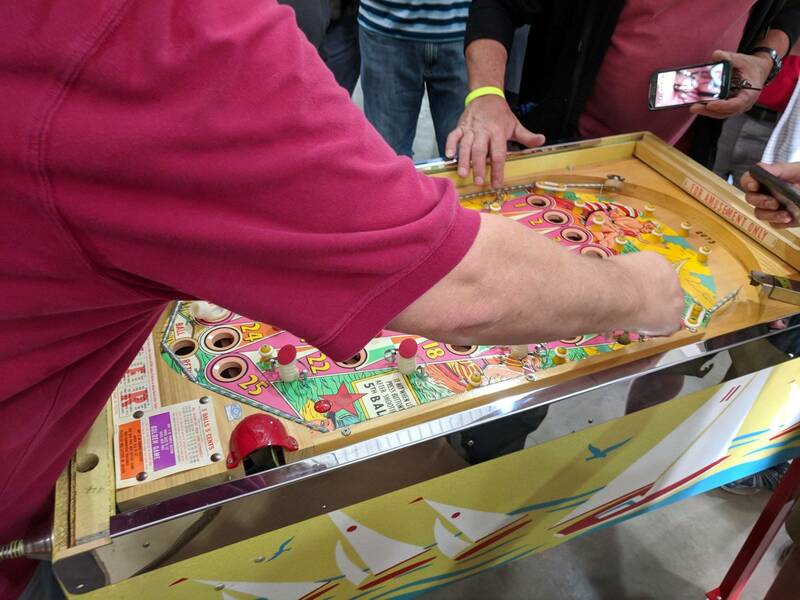 105 games can be played using the standard 25 hole layout with rollovers. United's Caravan - one of three games with the Roto feature - this was another of my games - it is very player friendly, with many features to help the player win. United's Starlet - the second of three games with the Roto feature - where Caravan has red diagonal scoring, Starlet has horizontal scoring that can score separately from vertical/diagonal. Thanks to Mickey for bringing the game! 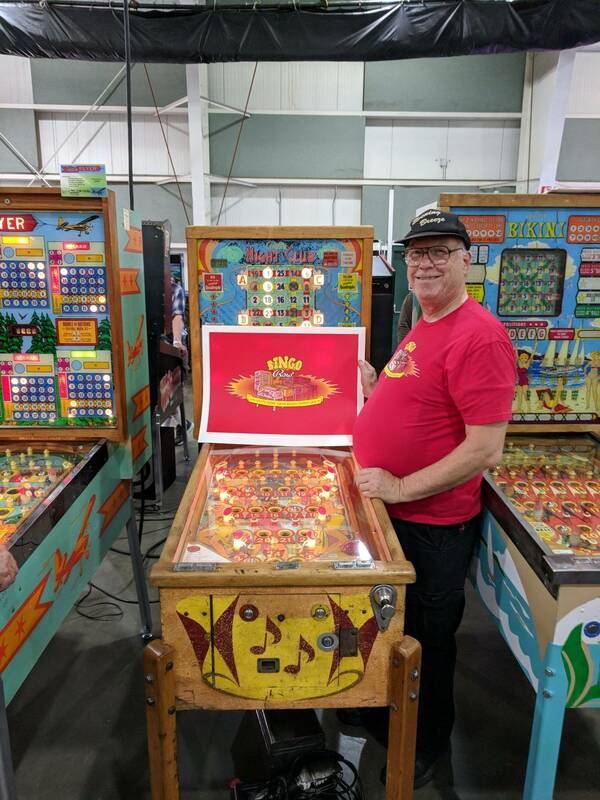 Bally Circus Queen - a Magic Screen game with an orange section that can score as green. I love the artwork and play options on this game. 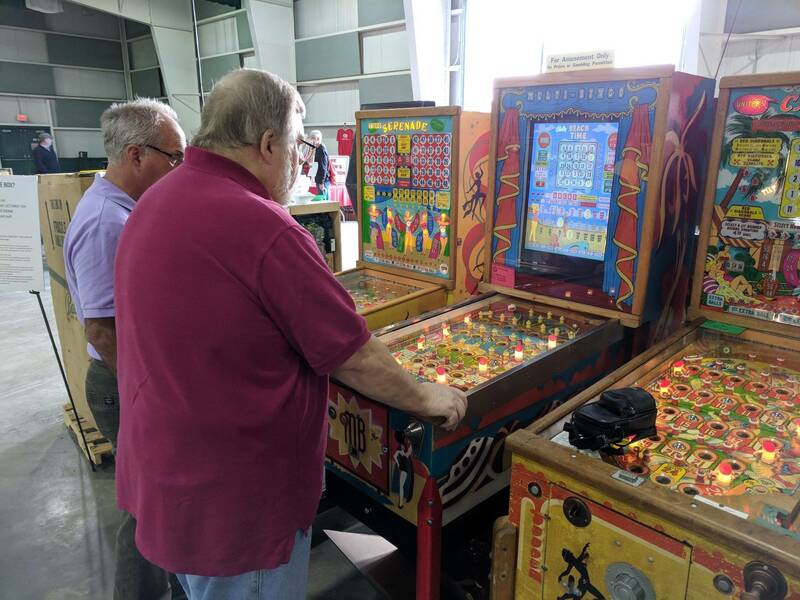 Thank you to Pete for bringing this machine! 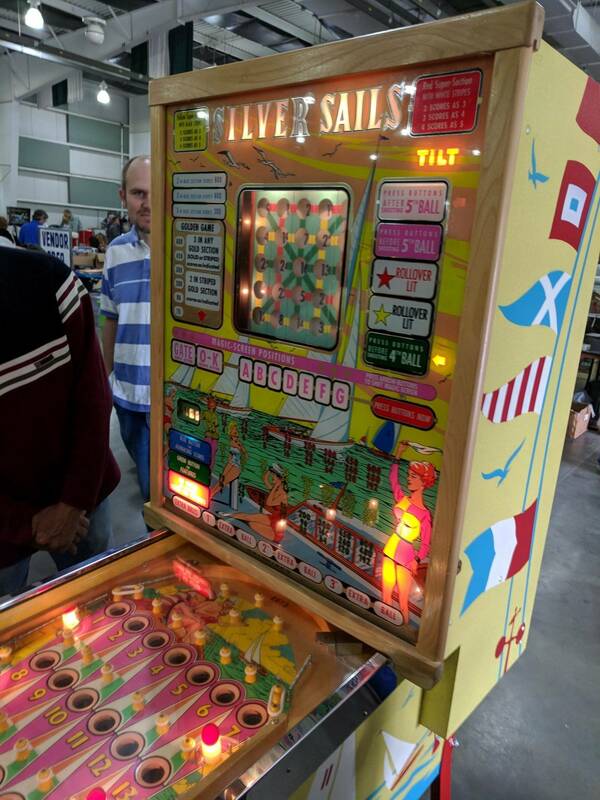 Bally High Flyer - a late-model six card - 8 coin max - the first game Bally produced with red diagonal scoring. Thanks to Chad, Len, Ed and Ed for bringing the game! Bally Bikini - a Magic Screen game - one of two with the Futurity feature. 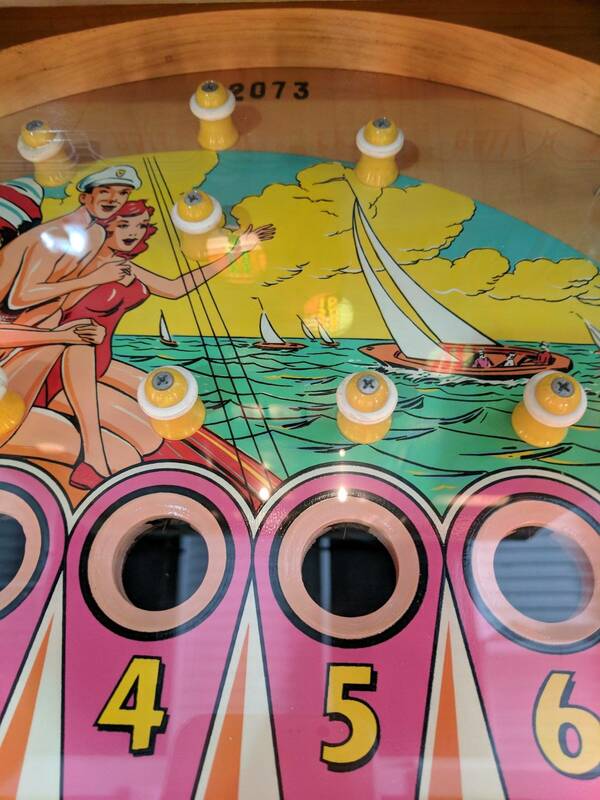 Instead of providing you with a red letter game immediately upon scoring in the orange section, Bikini and one other game will store the OK game for future use. You can continue to add to the OK game to build up and start a massive OK game using this feature. One of the games I learned to play on, and I'm always glad to play it. Thanks to Mickey for bringing this game! Bally Night Club - this was the first (and my favorite) Magic Squares game that I ever played. I love the quadruple scoring feature, Ballyhole (1st Extra Ball is free! ), and of course the mechanical animation of the Squares themselves. This is the same game that I played back in 2012 and pulled me deeper into my bingo addiction. Thank you to Jeffrey for bringing the game! 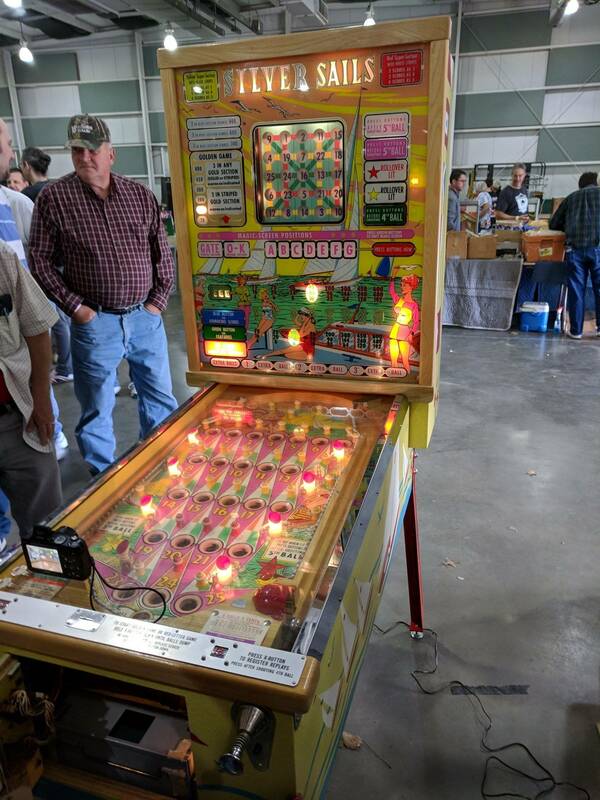 Bally Miss Universe - this is an unusual game - only 3 balls, so getting the spotted numbers feature is very helpful. 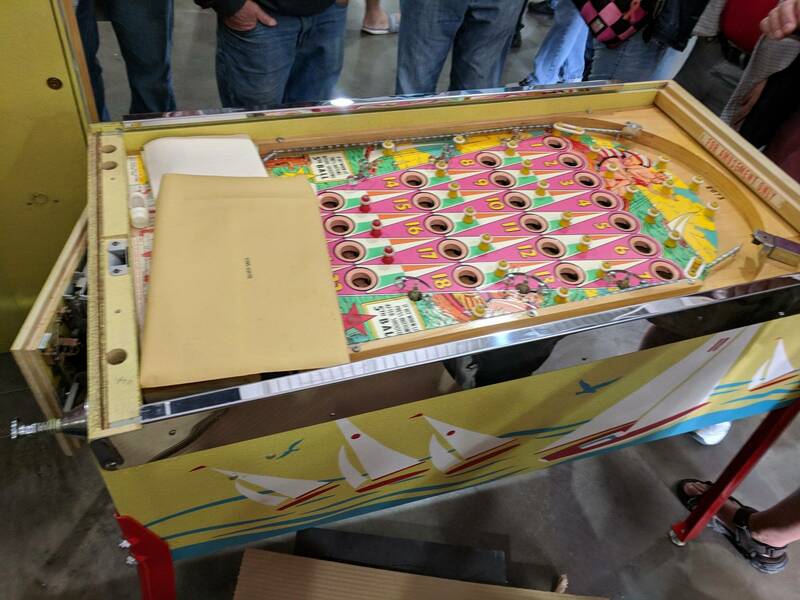 The 18 hole layout is unique (Bally had another game planned called Continental with the same layout, but did not produce them). 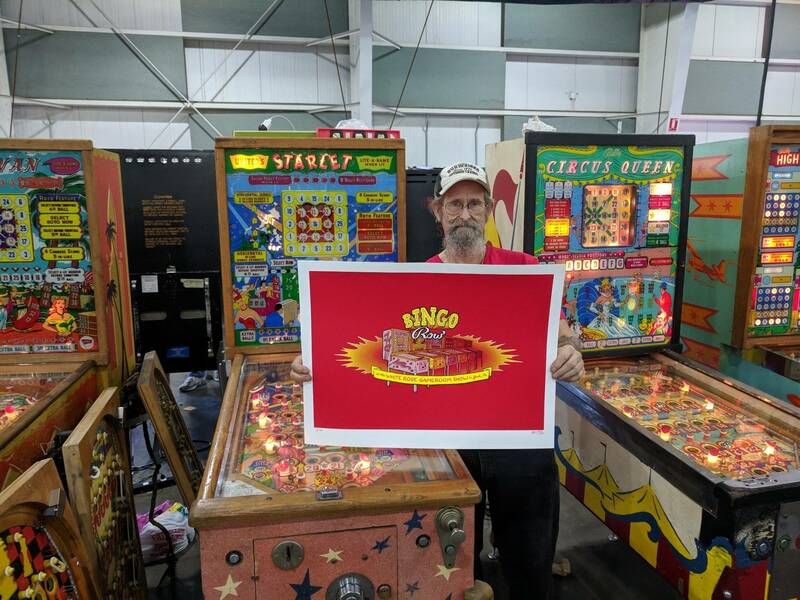 Thank you to Jim for bringing the game! 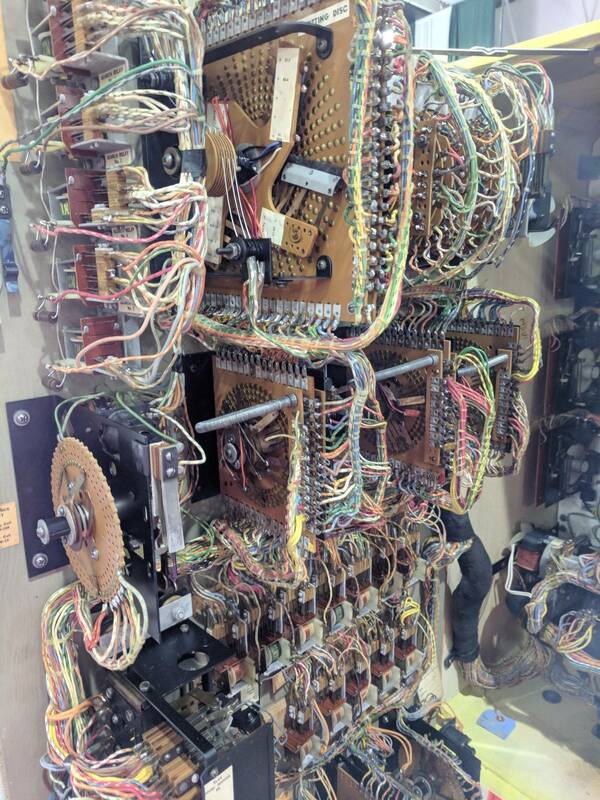 Someone racked up over 1000 credits on this game. 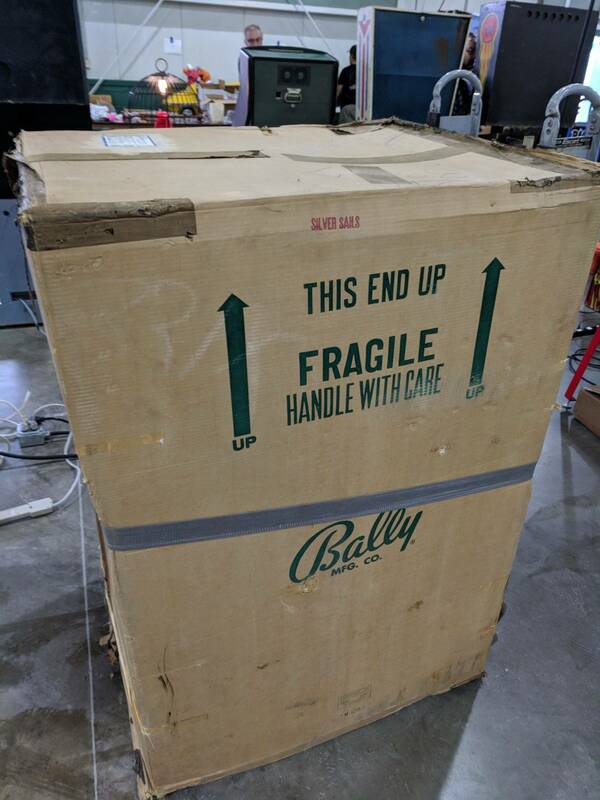 And of course the brand new Bally Silver Sails - this was still in the box, to be publicly opened on Friday morning. More on this later, but thank you to Dennis and Jon for bringing the game! 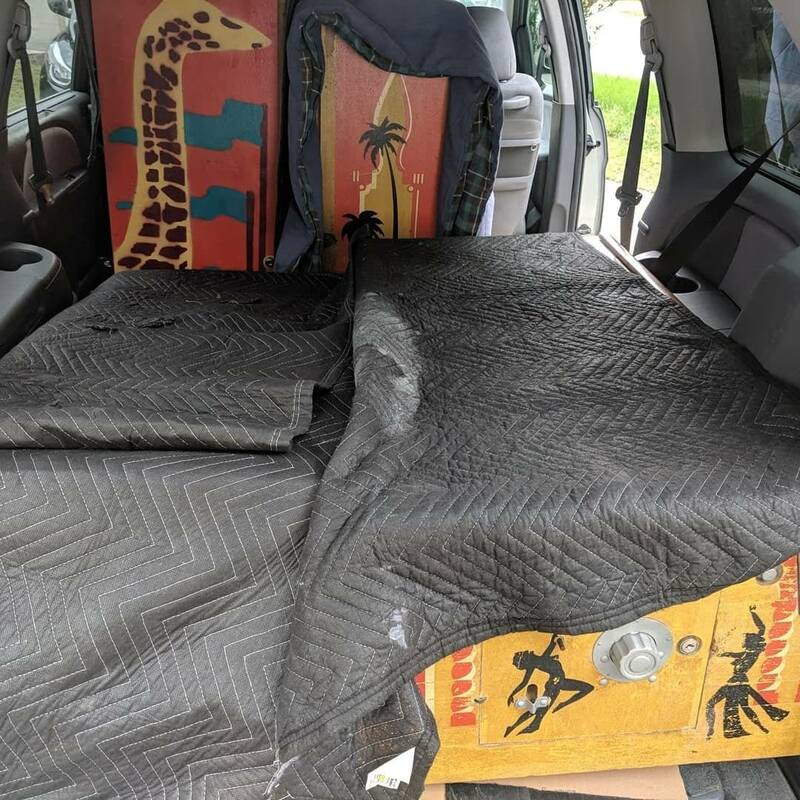 It wasn't easy to transport, for sure. An amazing effort, collaboration and of course result. Nothing like it will happen again as a free to public NIB aged by 50+ years. 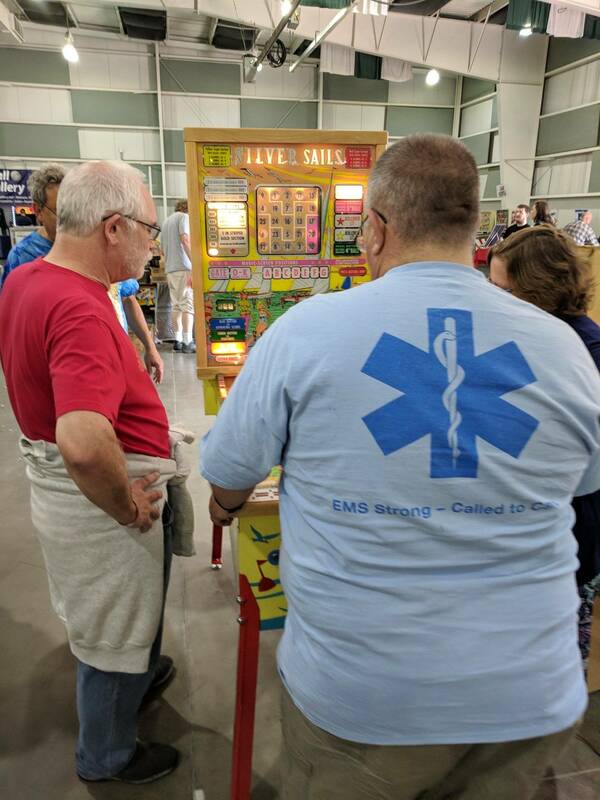 Can't imagine anyone coming up with a better gimmick to entice people to enjoy Bingo pin games. Ned, Noj, and Kcin did a bang up job! Great write up thks. 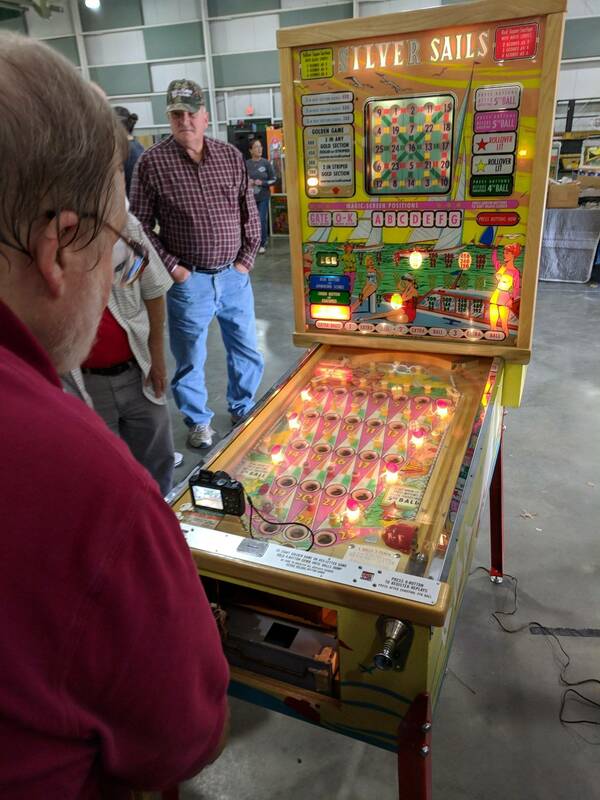 Is there a vid you can suggest which best describes a bingo machine and its play functions for someone with no knowledge on these machines? Year. Thanks to everyone that showed this newbe how Challenging they are! 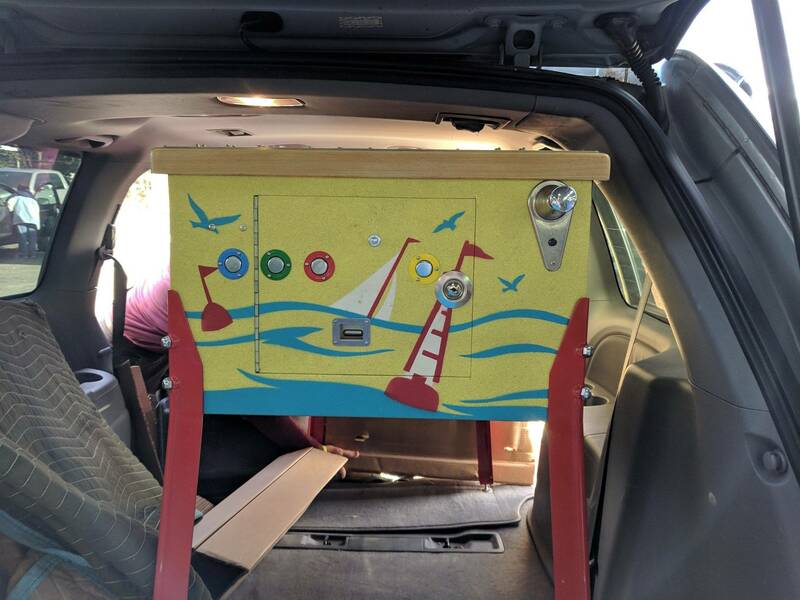 Sorry for the belated writeup - on Thursday, I headed up to York with my couple of games in the back of the van. Once I arrived, the show was just getting set up. 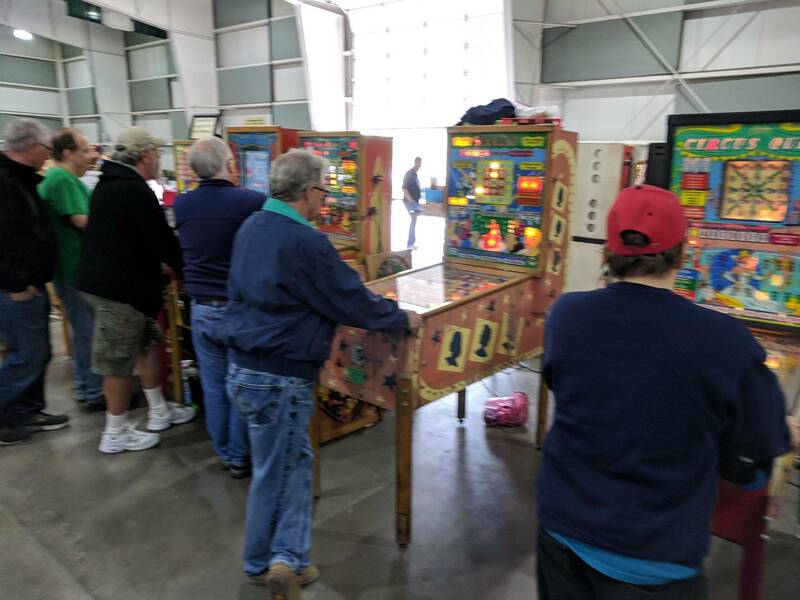 I unloaded quickly to beat the rain and staged the games off in the corner as more and more Bingo Row folks arrived. 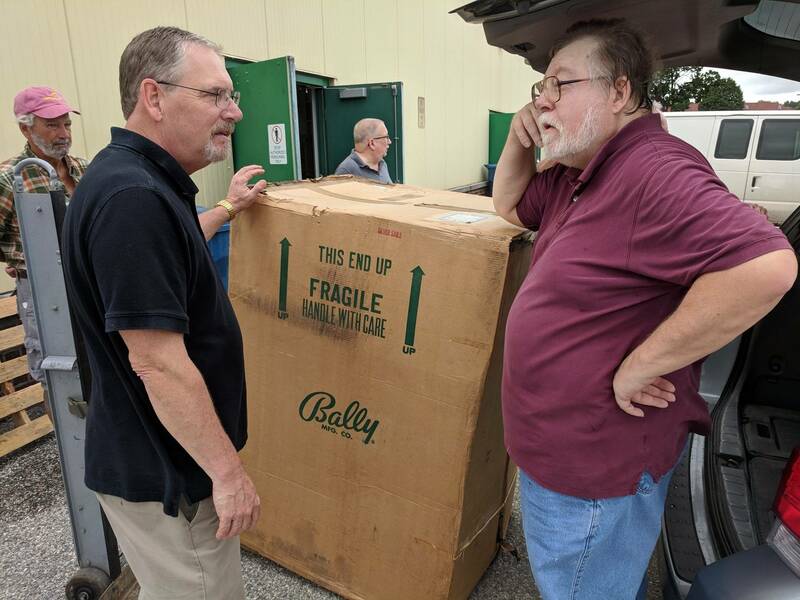 Dennis and Jon arrived and the mystery box was unloaded. 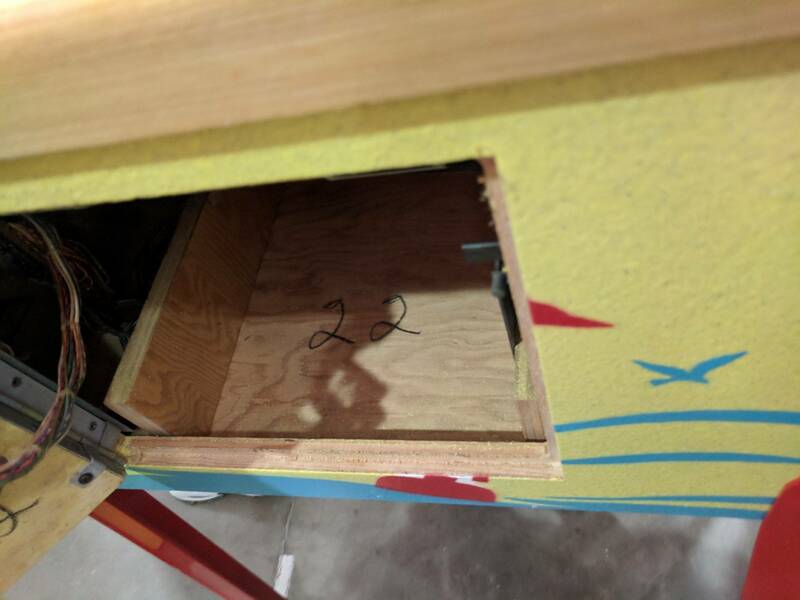 The box was moved to a new spot, right at the cornerstone of Bingo Row as the Row participants started filling it out. 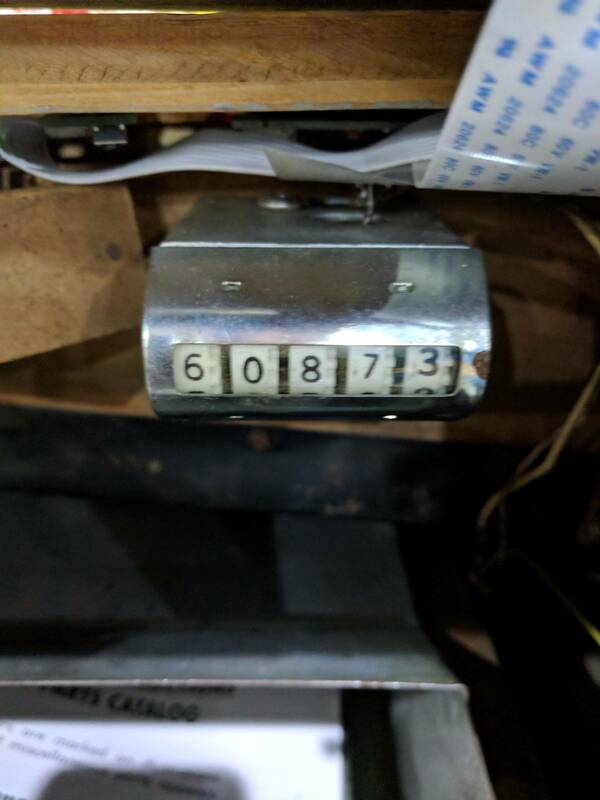 One thing that was really neat about the outside of the box - the top was marked with the denomination of the coin mech/lockdown plates inside. 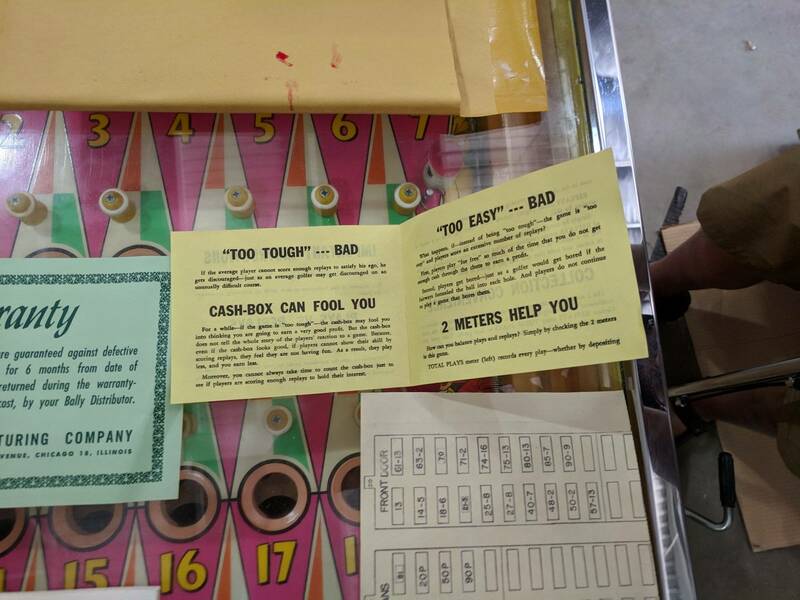 The games were sold in 5/10c options. 25c might even have been available from the factory at that time, but it would have been rare. 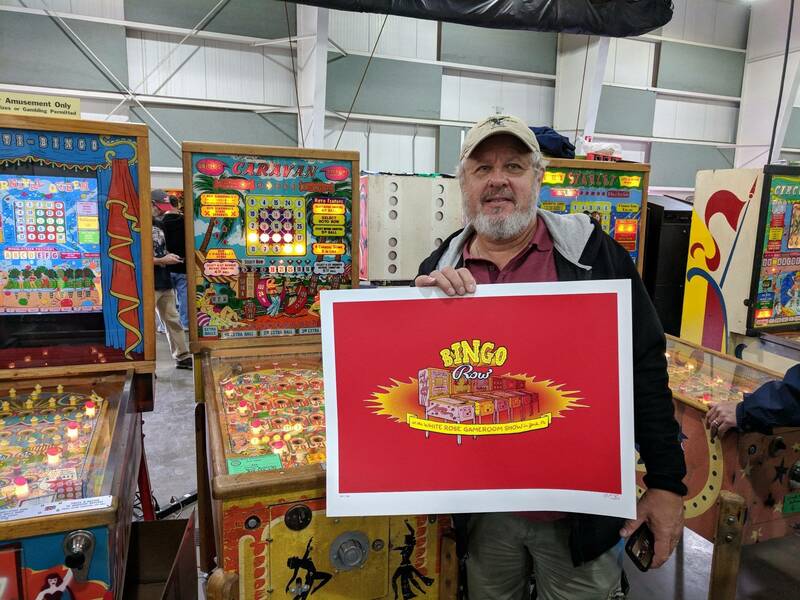 A few of the Bingo Row participants cracked their first four or five in lines and won the prize on that first day. Hey, did you see this row? Ignore the pizza. That's only part of it. 10 games total. Dennis got to try the Multi - I have been waiting for this picture for 3.5 years! Dennis has been a huge contributor to the Multi and I absolutely could not have done it without him. 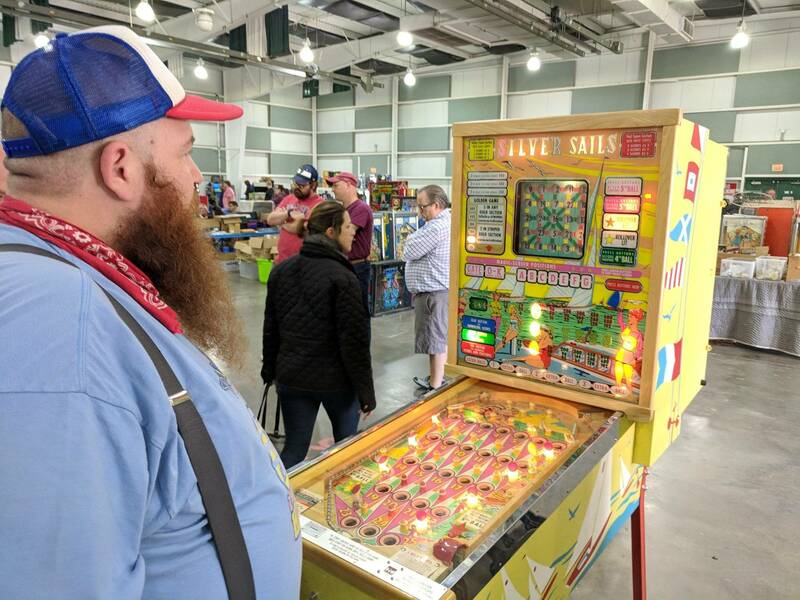 It was gratifying to see him put a game on it, but I was so busy afterwards that I didn't even get to ask him what he thought of it! The list of questions to answer. 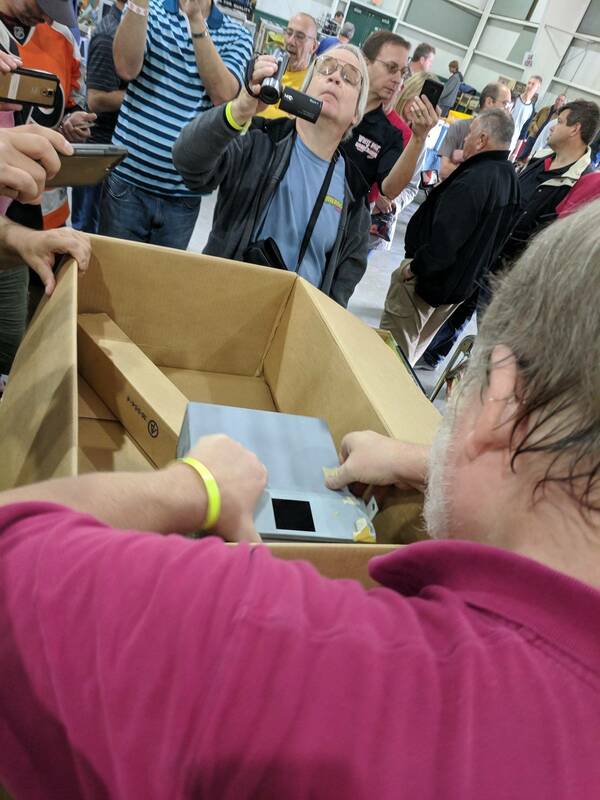 Dennis starts opening the box! Packed with the back of the head facing the side you cut open. Clever. The is simply a gorgeous game normally, but fresh out of the box, it is even more beautiful than I imagined it would be. I cannot believe that the backglass was intact and that the wood trim was so light! The cabinet is packed on the shooter rod end, with a bit of cardboard wedging it in place. As you can see, the paperwork is stuffed under the glass. Glorious. 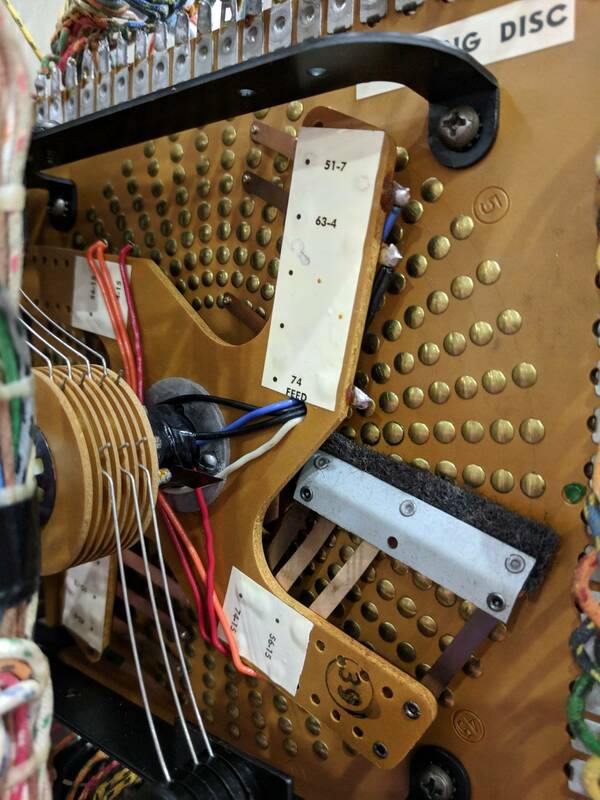 The keys are tied around the shooter rod. 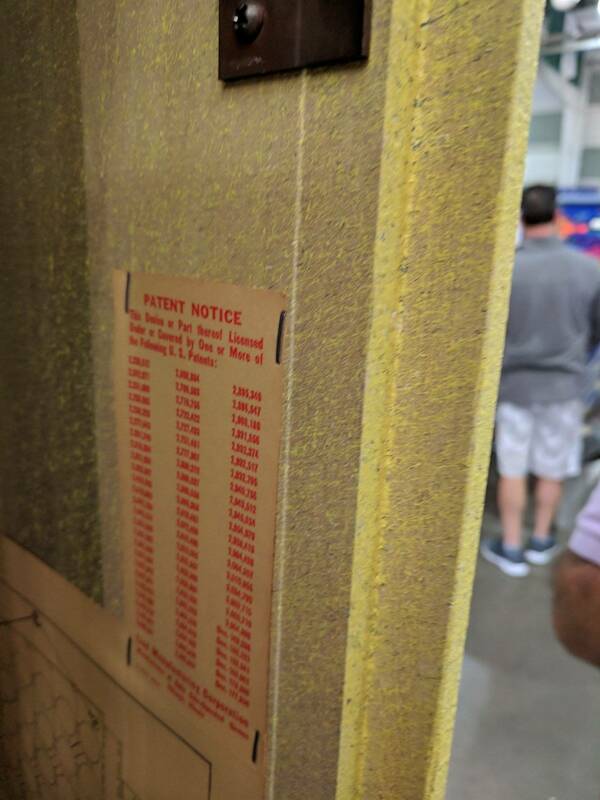 The red posts did have "dead" rubber, from the factory. 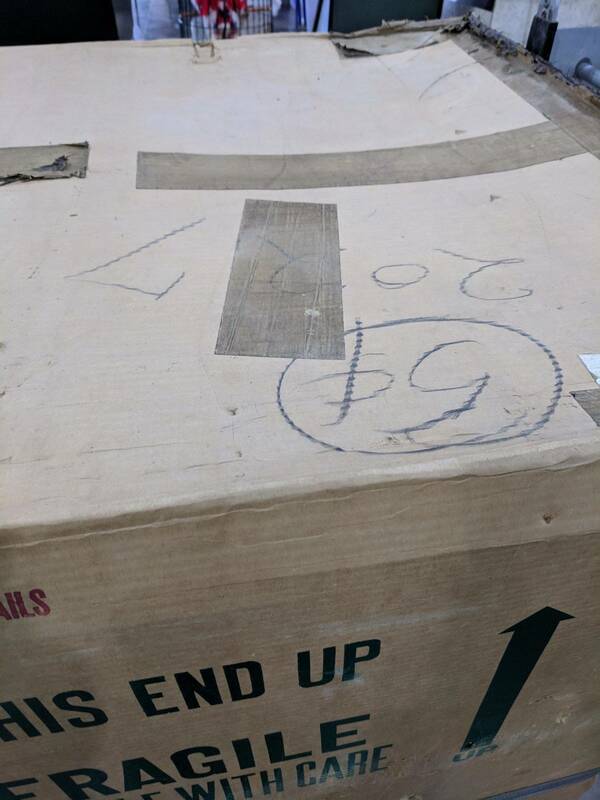 This box was packed on top of the head. 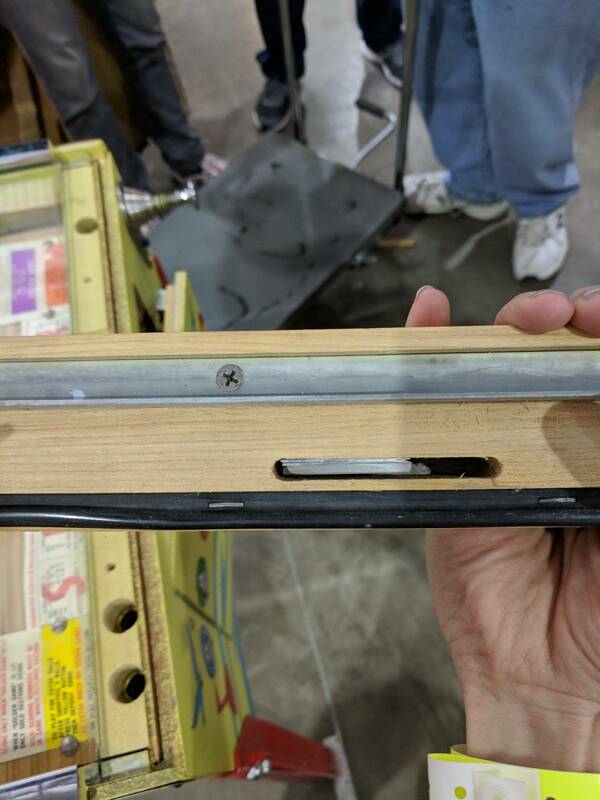 When opened it had multiple treasures inside. 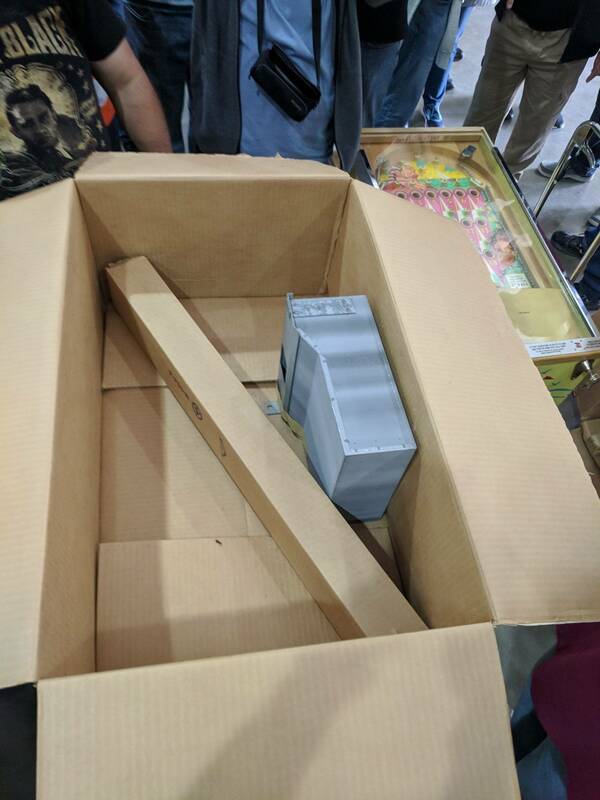 A coin box (with bag o' bolts inside), box of legs, and a coin box lid(?) 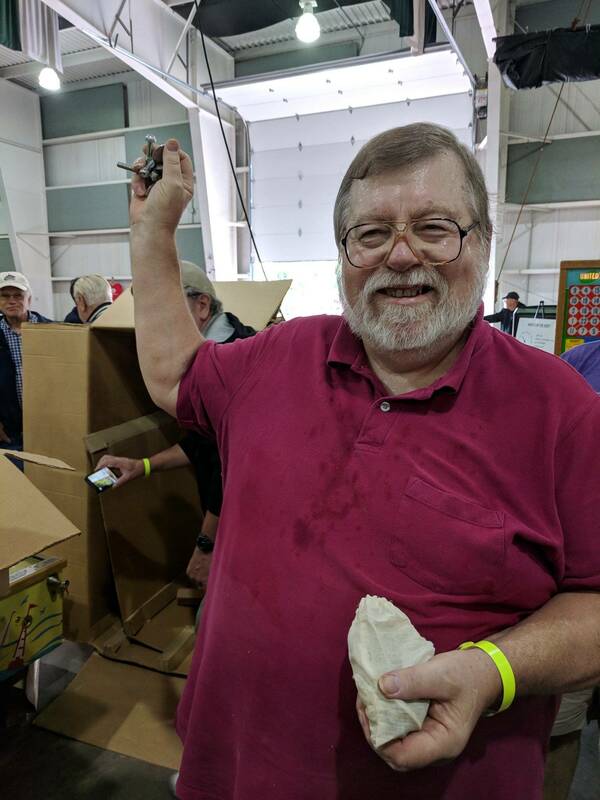 - none of us had ever seen a bingo coin box with a lid before. In speaking with operators, I'd guess they were more of a hassle than they were worth - too much cash coming in to bother with a little lid. The box on the left contained the balls, and the bag on the right contained the bolts. The legs contained the reinforced leg plates. The very, very light beginnings of a ball trail. 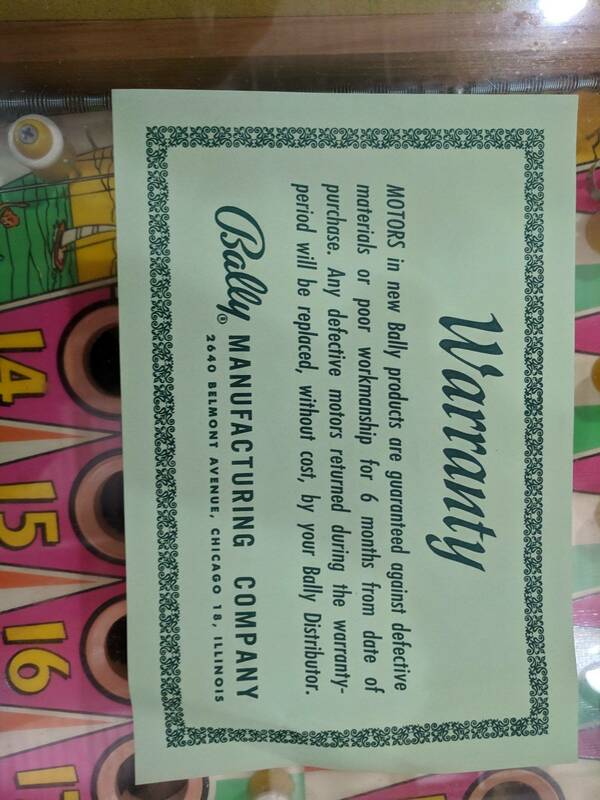 The rebound rubber was not stamped "Bally", but did have marks from a ball testing. 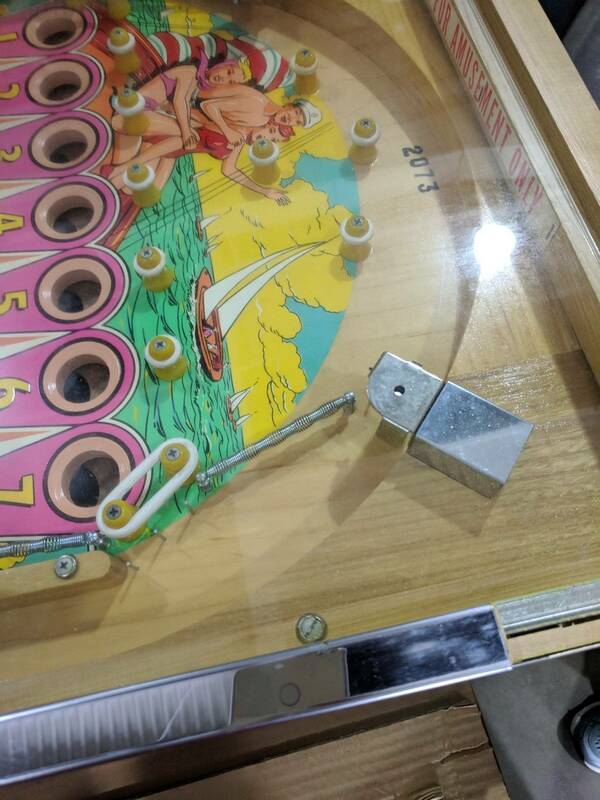 The balls were magnet-resistant from the factory. 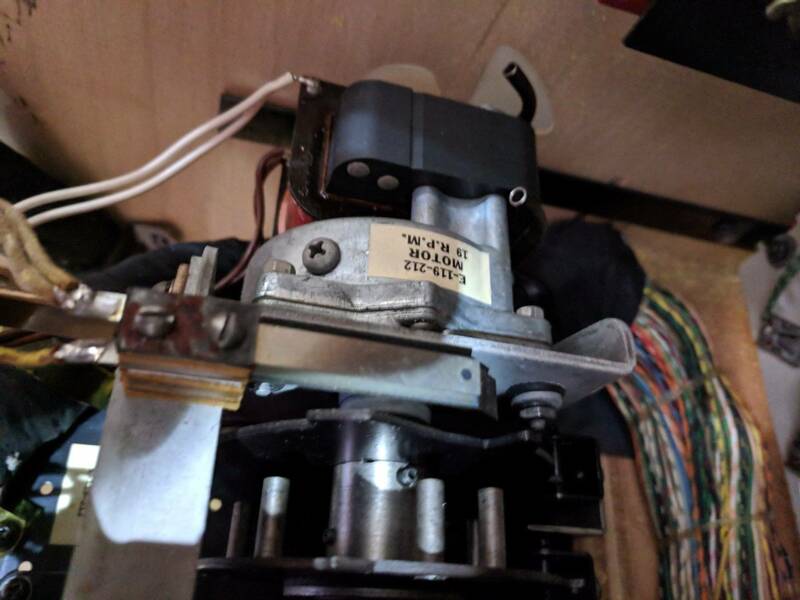 Tag attached to the coin mech. 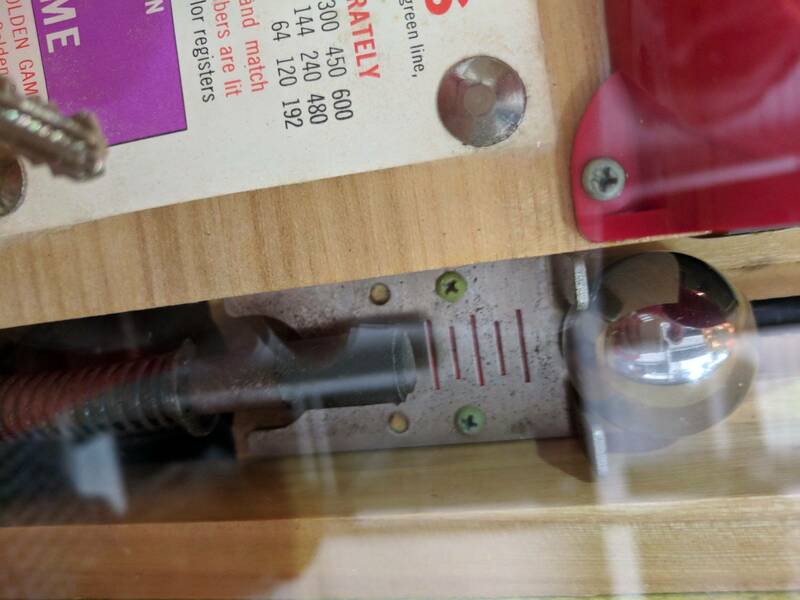 Note that the hardware to convert the coin mech to a dime mech was included in a small baggie inside the coin door. Test replays on the meter. Have I mentioned that this game is pretty? It is. 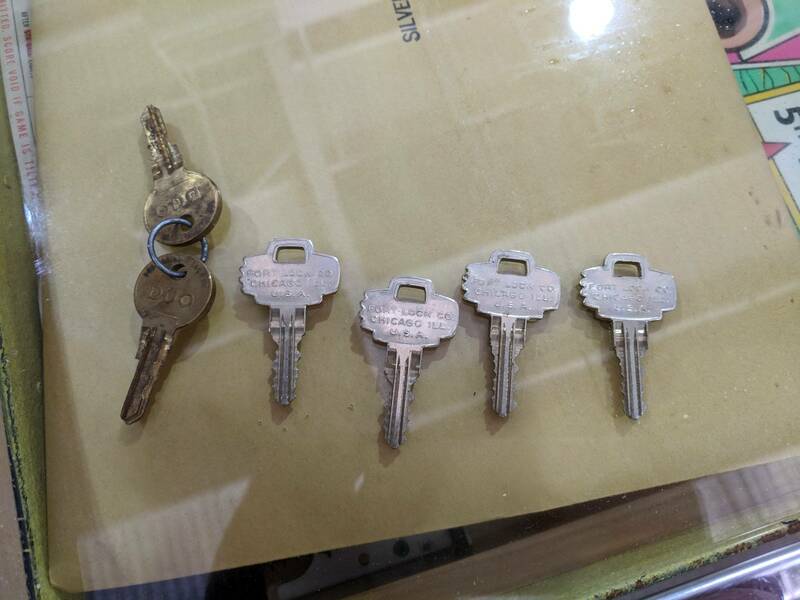 Different stock and number keys. 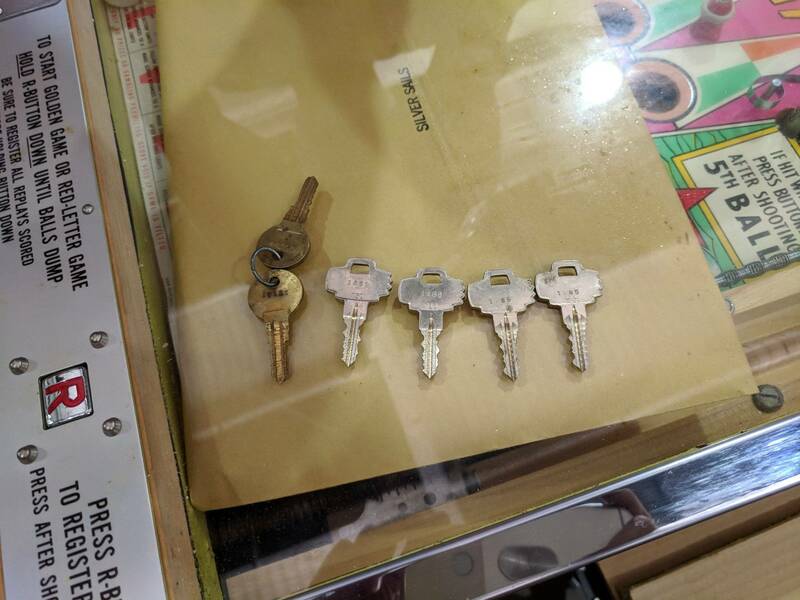 Left two are coin door, side locks and back door on the right. The plunger was one of the only spots of rust/corrosion on the entire machine. Very odd. 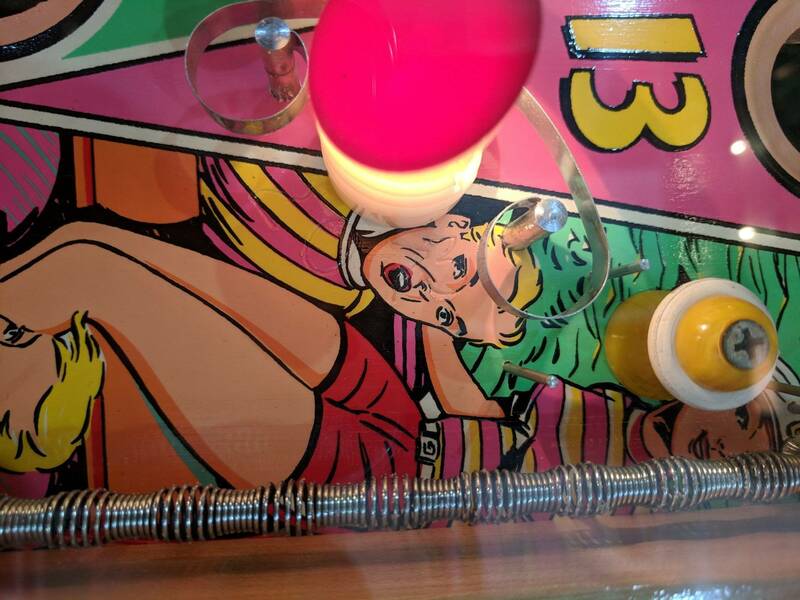 It used a different style of plunger tip - flat instead of billowed like modern flipper games. I'll have to ask Steve Young about that next time I call. Jones plug chart! 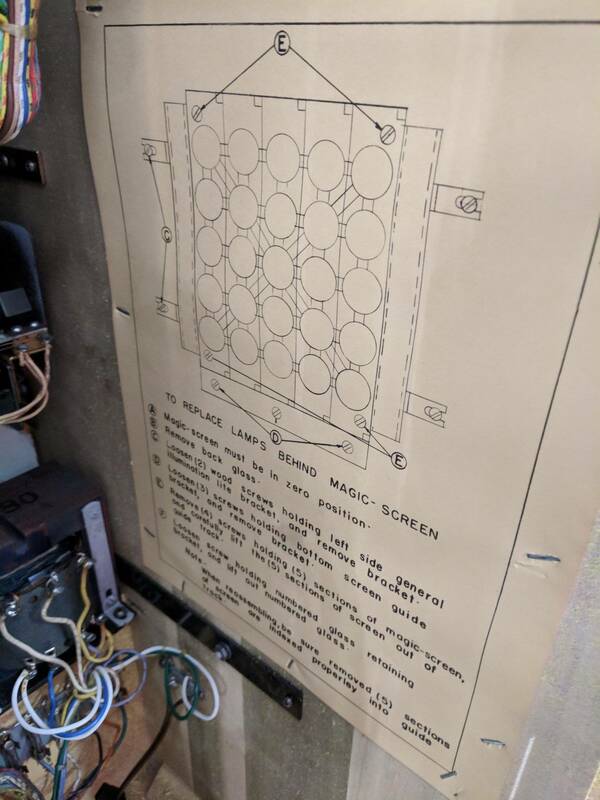 This would be handy, even though the plug charts are also in the manual/on the schematic depending on the game. Nickle and Dime cards included. 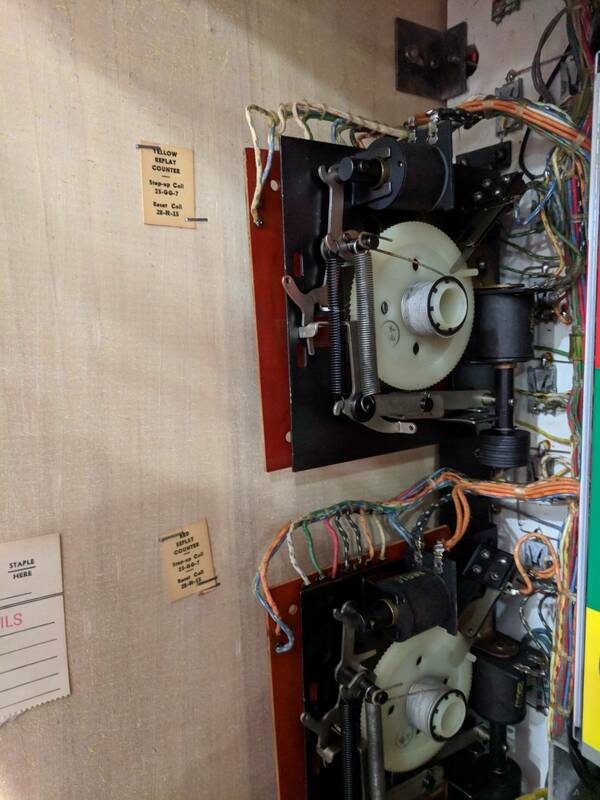 Bally painted all of the hardware, including these brackets. Very odd. Boy, I would have loved to have seen that. Did they plug it in? Yes, and with minimal intervention, it worked! Incredible. 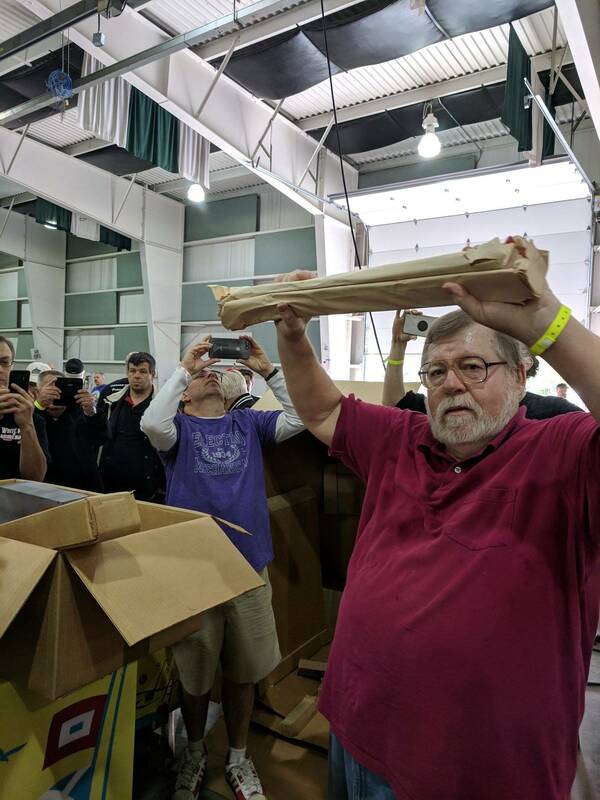 The unboxing of the "Silver Sails" was an awesome event. I was thinking that it would not work due to lubrication issues, but it did! The genius of the design on this and other bingos is simply remarkable. 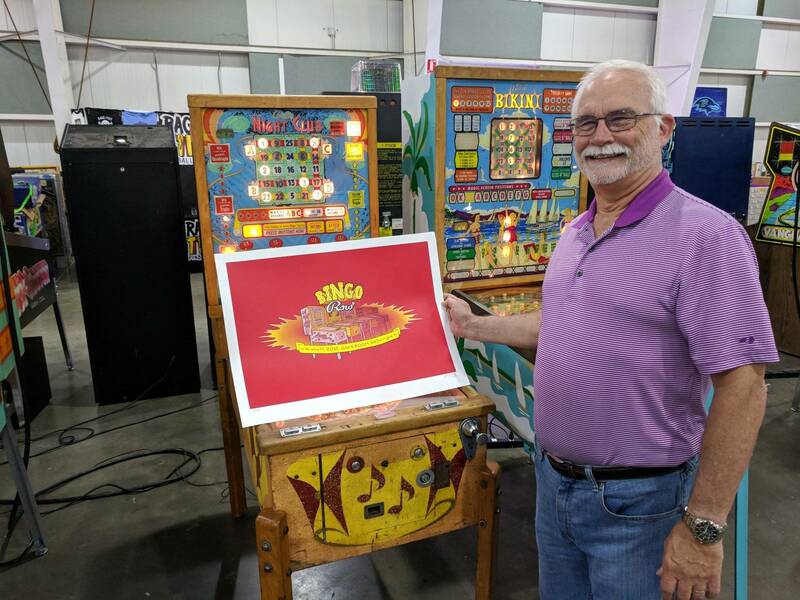 Thanks to Dennis for bringing this game all the way from St. Louis to share with us. Nick, you are quite a young man, and your multi-bingo is truly an outstanding achievement. Thanks for sharing it once again! 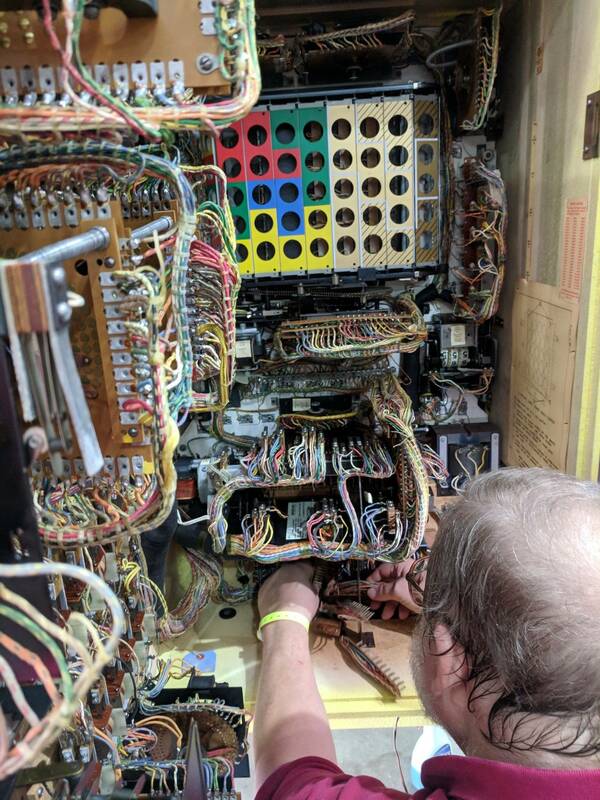 Wow what a sight a brand new 56 year old machine in pristine condition (except the shooter rod)-quite remarkable. Thks for sharing. 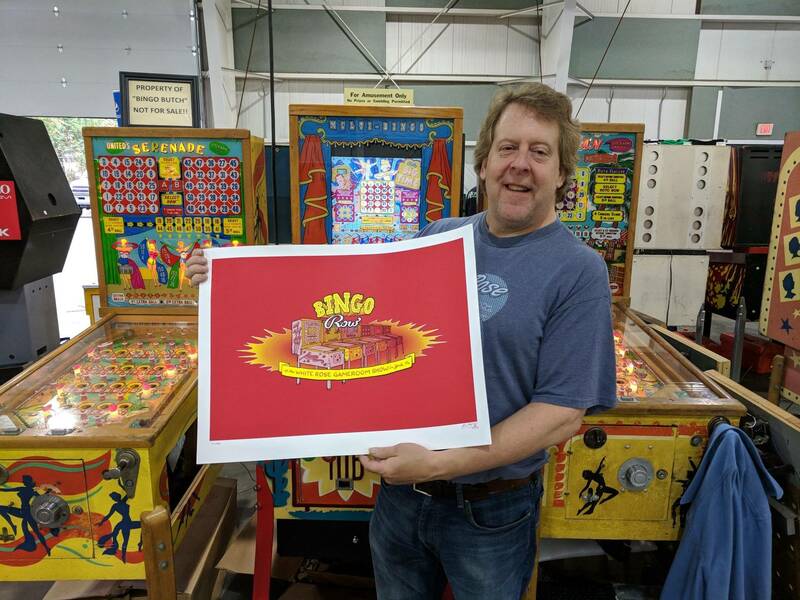 Thanks jrpinball - I definitely agree about the design genius of the bingos - simply amazing! jeffc I haven't even started on my video yet - great work! 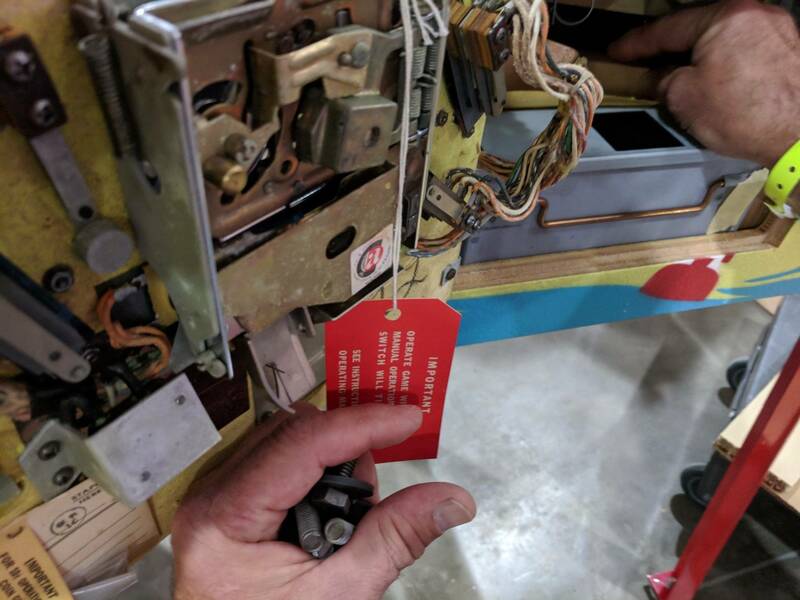 The serial number on the head - looking back at the playfield picture, you can see that the playfield serial and head serial (cabinet matches head serial) - do not match. 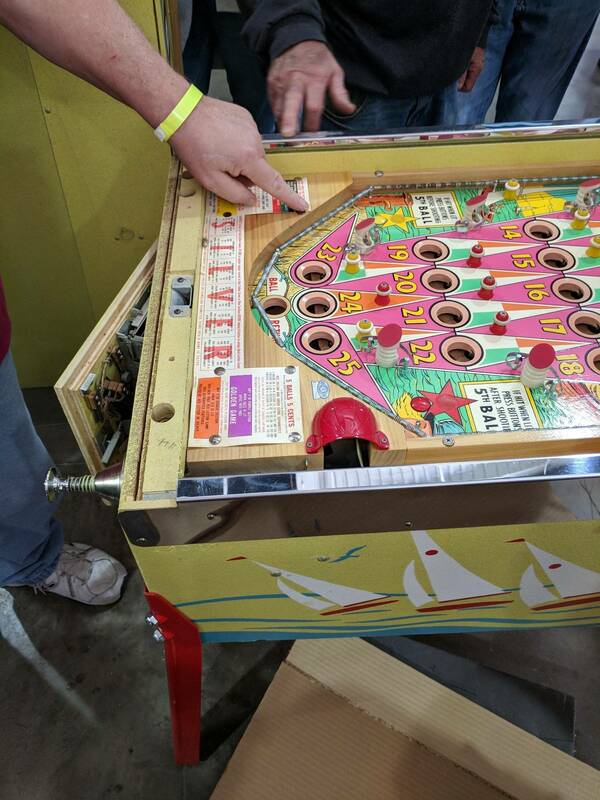 In other words, they grabbed the wrong playfield when assembling this game. 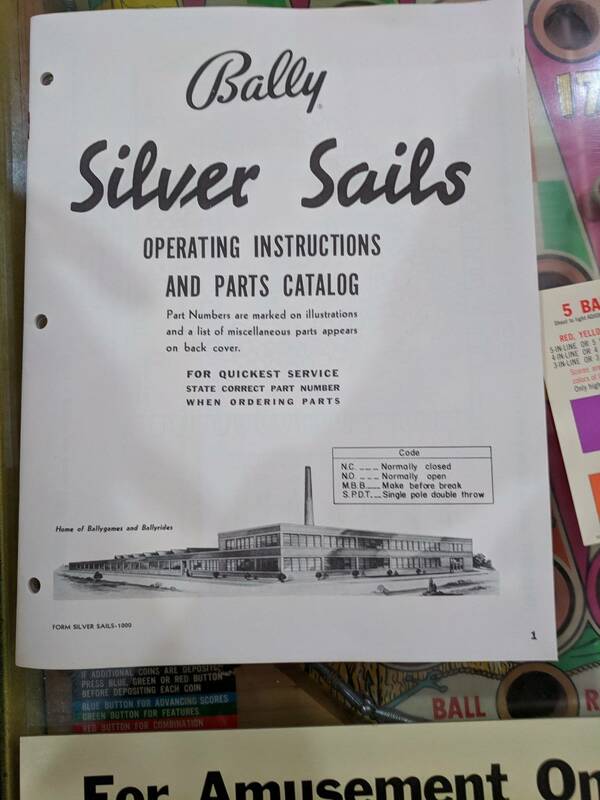 I've always heard tell of Golden Gate parts in Silver Sails, and that kind of careless assembly is shown, in part, by the non-matching serials. 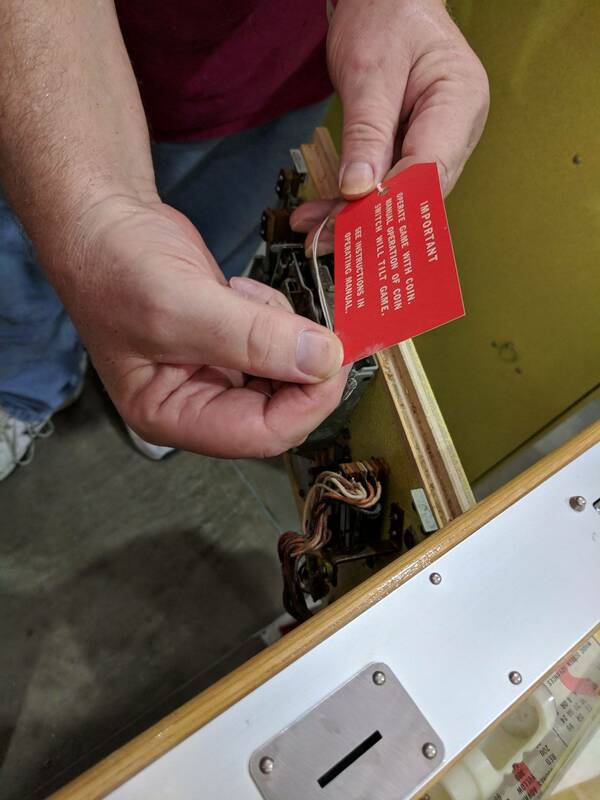 Oddly, the score/instruction cards were tacked down from the factory! I would have never suspected this. 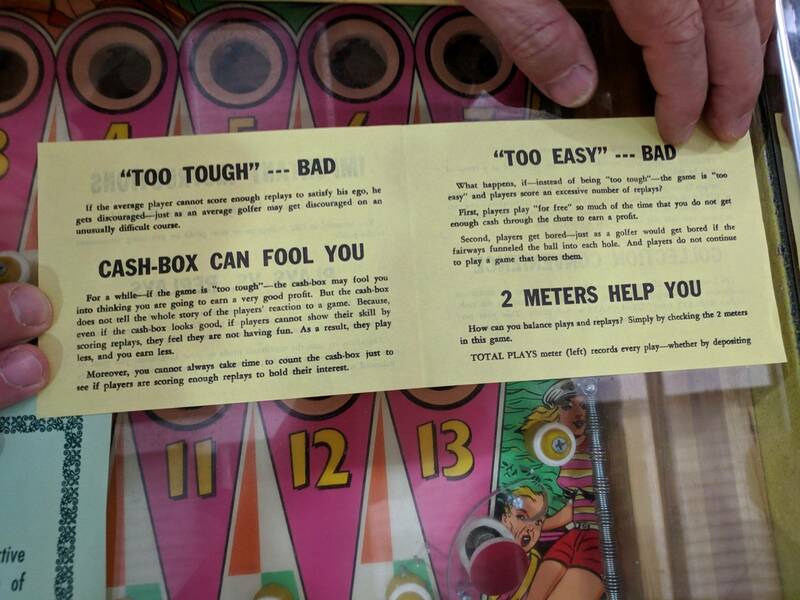 Bally included two additional tacks in the paperwork envelope if you wanted to change the score card to show a dime instead of a nickel. Yhey didn't include 4 tacks for some reason. 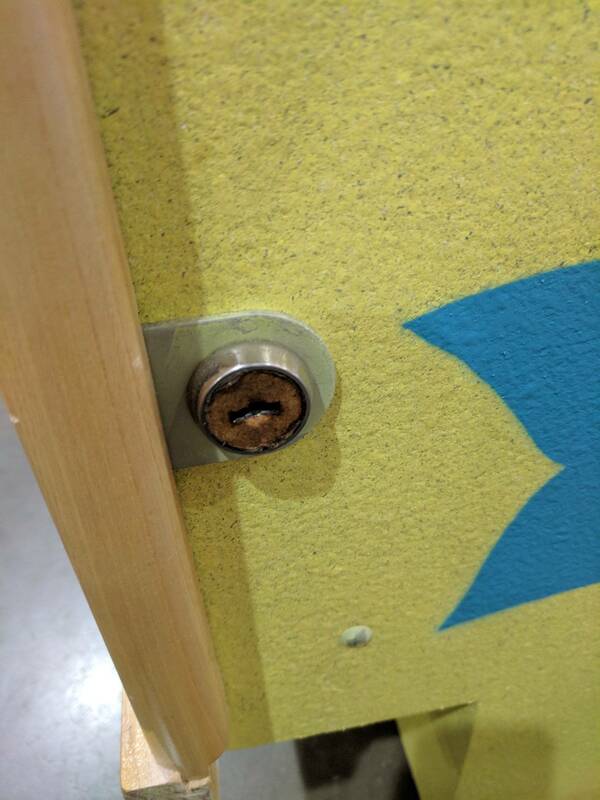 Anyone who has tried to pull one of these tacks will tell you that they break almost immediately. Another shot inside the coin door. Under the lockdown bar - simply incredible. More under bar shots - gorgeous. 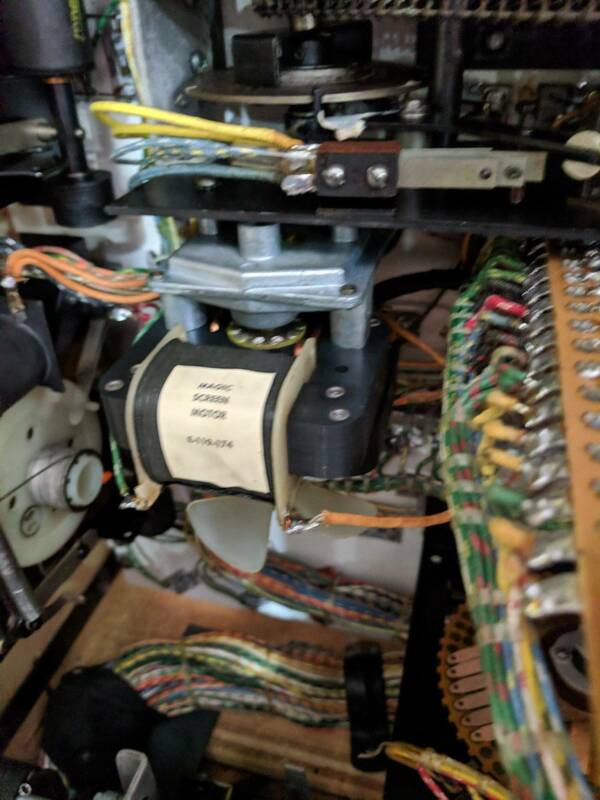 A brand new spotting disc on a brand new mixer unit. I've never seen its like. Note the labels on the arms for the spotting disc. Those are almost 100% of the time missing or covered in grease. Unwrapping the power cord and a peek at the other units inside the back door - Control Unit and Magic Screen Unit. We had one winner, a young lady, who was bound and determined to earn her 4 in a row and win the poster. She worked very hard and got a 4 in a row on Serenade (a tough game!) - I was very impressed by her determination and skill. Friday ended well - lots of tutorials given, more posters dispersed, and tours of the inside of the Silver Sails. One person challenged me to give a 30s overview of all the units within the backbox. I did it with time to spare. Wow. I don't know anything about these but that is awesome! 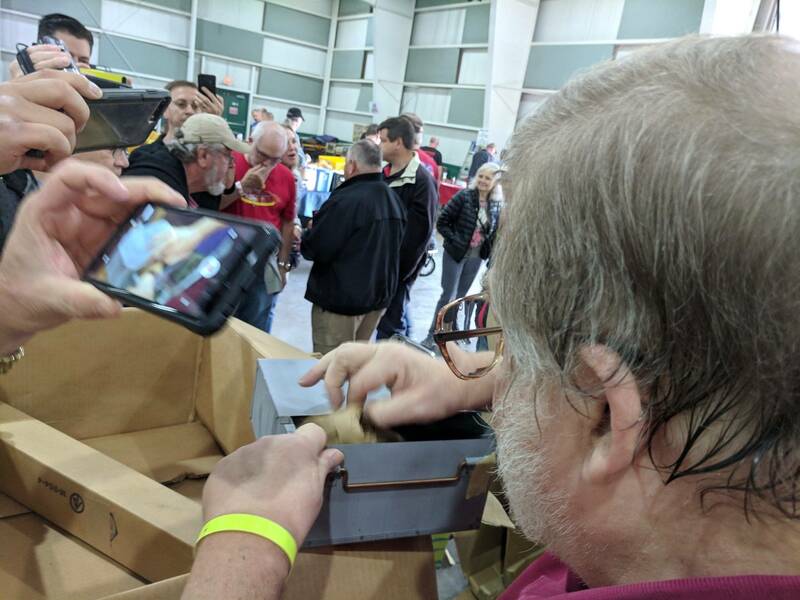 I did get to play a little at York and some nice gentleman was kind enough to explain it a bit to me. Really neat games. gliebig - excellent! That's exactly the idea - people tend to like playing them once they understand them a bit. 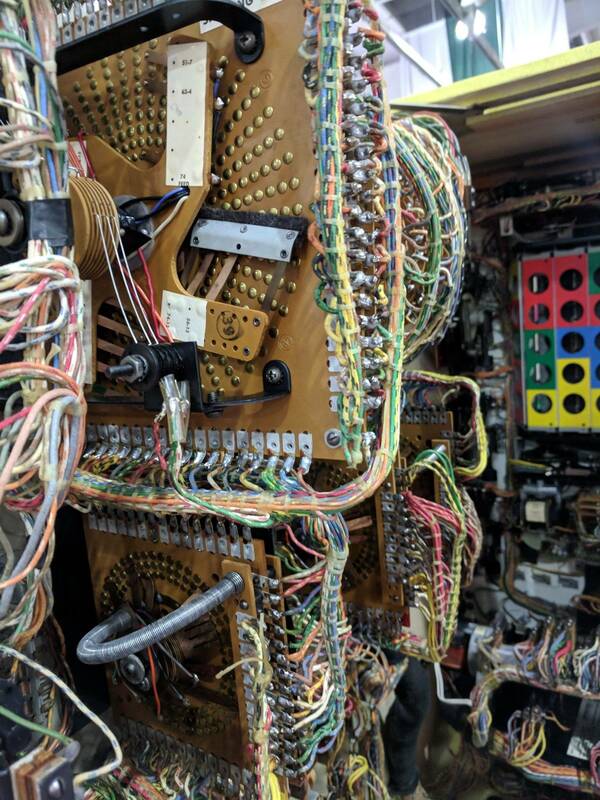 They are truly fascinating machines that require a lot of skill to play well. Saturday! 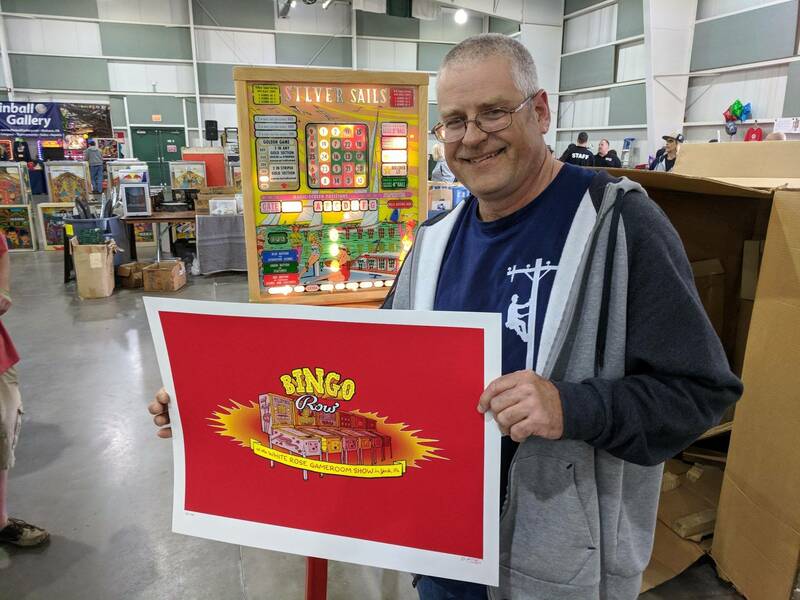 Some of the folks from Woodrail Row have started giving bingos a shot - I am pleased that the skills are transferable and they are getting their awards. 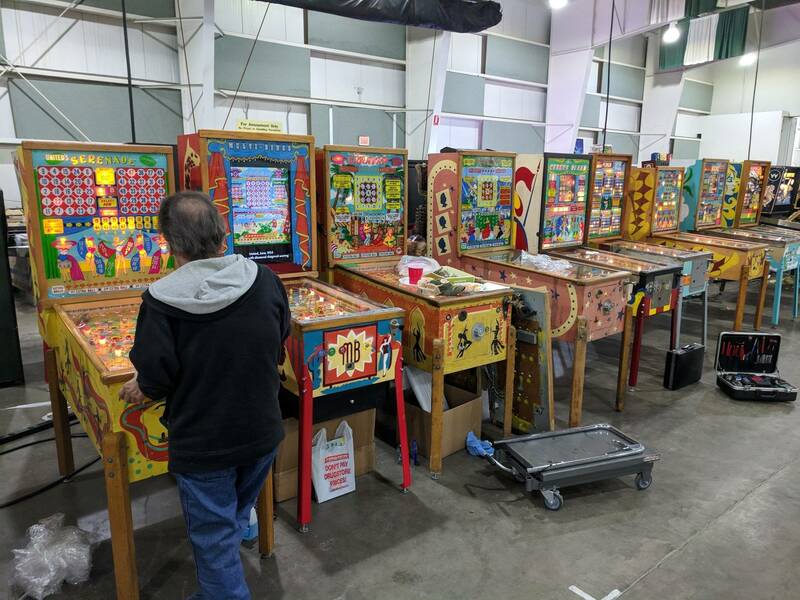 The High Flyer sold and was out of the row on Saturday, but things were still hopping. Sizing up the game before playing. Jon tries out the Multi! The Australian delegation also received awards! 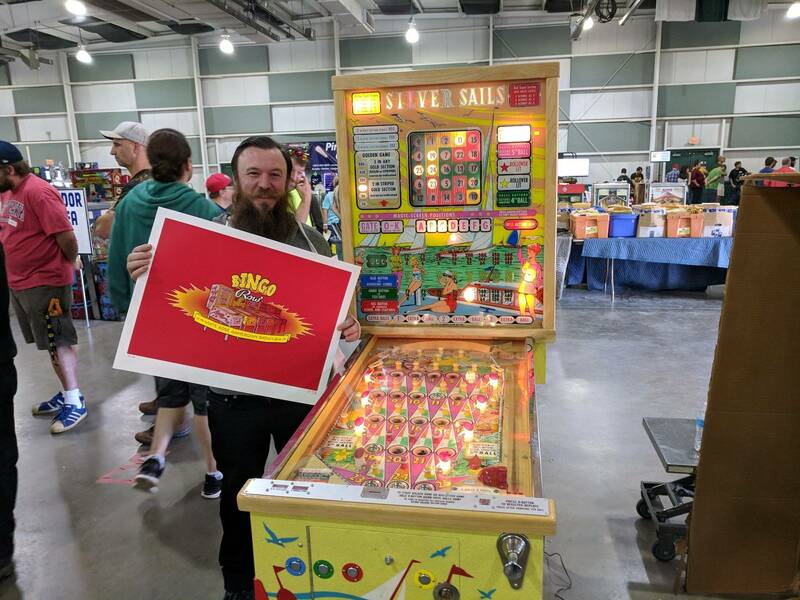 And the show announced the winning games - Best Pinball went to the Multi-Bingo, and Player's Choice went to the Silver Sails! I was shocked and honored to hear that. 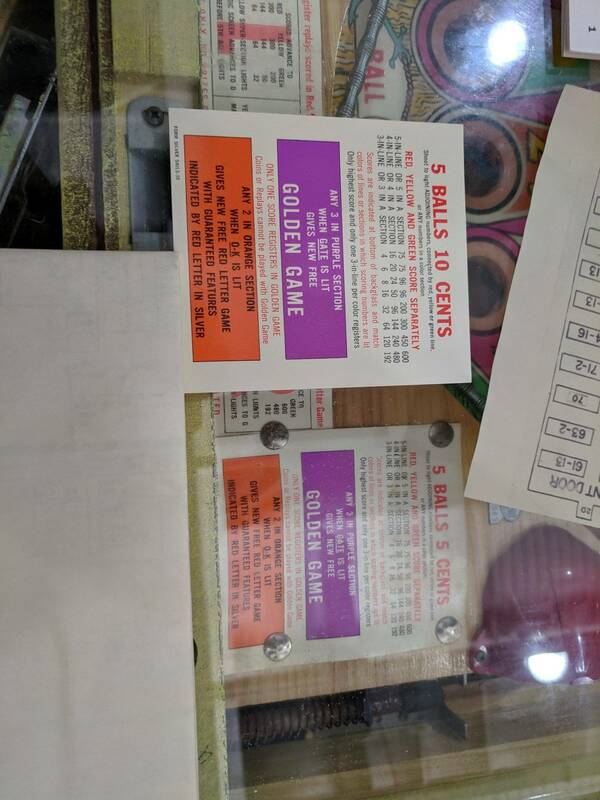 These were the only two pinballs to win awards, and to have both awards for bingos? I was floored. Dennis and I proceeded to the front of the hall where we received our awards (photo courtesy of the White Rose Facebook page). Thank you to everyone that had a part in this - it was an incredibly special cap on an incredibly special show. 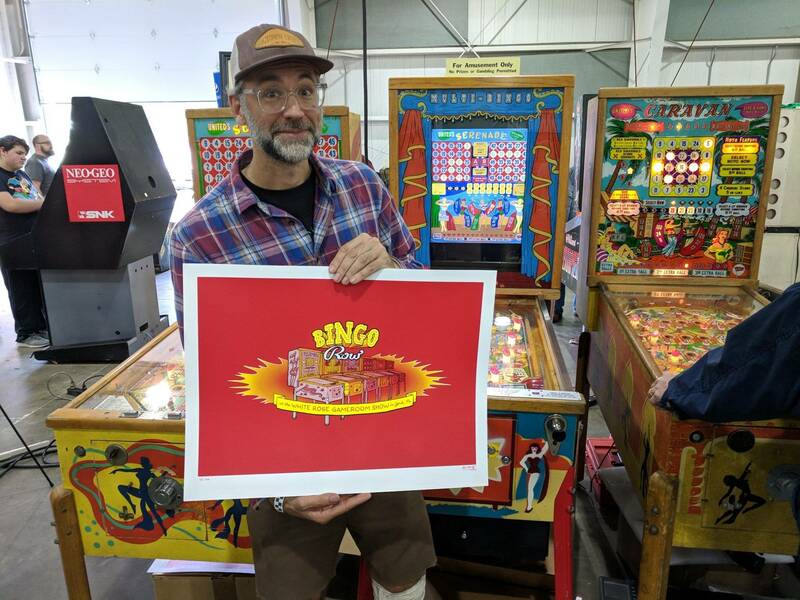 York is far and away my favorite show - and I am always thrilled with the turnout and response to Bingo Row. Thank you to everyone who brings games, who helps new players understand the games, and who asks technical or non-technical questions. Keeping the games alive is extremely important. 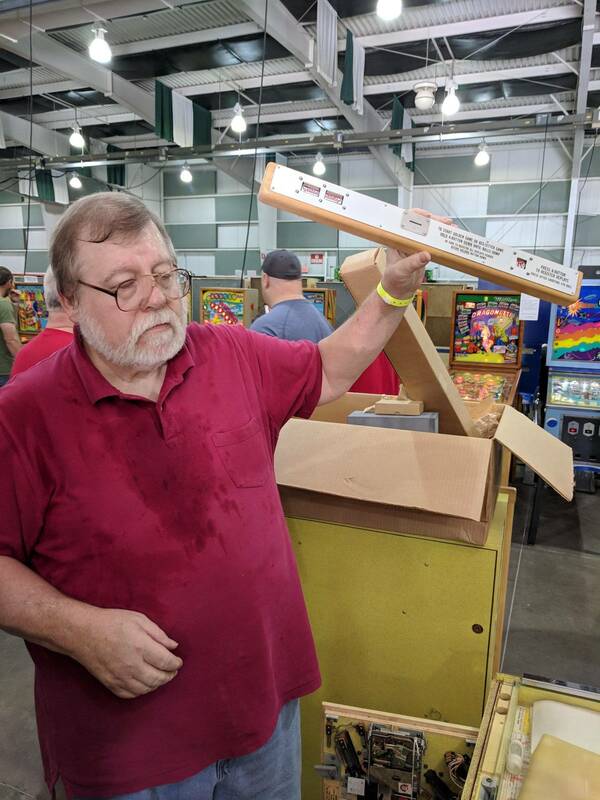 One final award was given to the man that is too busy to play many games at the show - @rmarket - thank you very much for everything you and the staff do to ensure that the White Rose Gameroom Show is such an amazing time year after year. I'll be back next year, as usual, and look forward to seeing everyone again. And if anyone has a game and would like to participate in Bingo Row, please do so! We have great technicians and players, a healthy mix of games, and bad backs. Silver Sails in the process of being loaded. The Multi-Bingo play counter after the show. 3748 'coins' - a nice healthy number of plays. Thank you to all that played it and gave me feedback. Nice job with the show. That NIB Bingo is amazing stuff. I am surprised it was so nice and fired up fairly easy after sleeping so many years. WOW ! 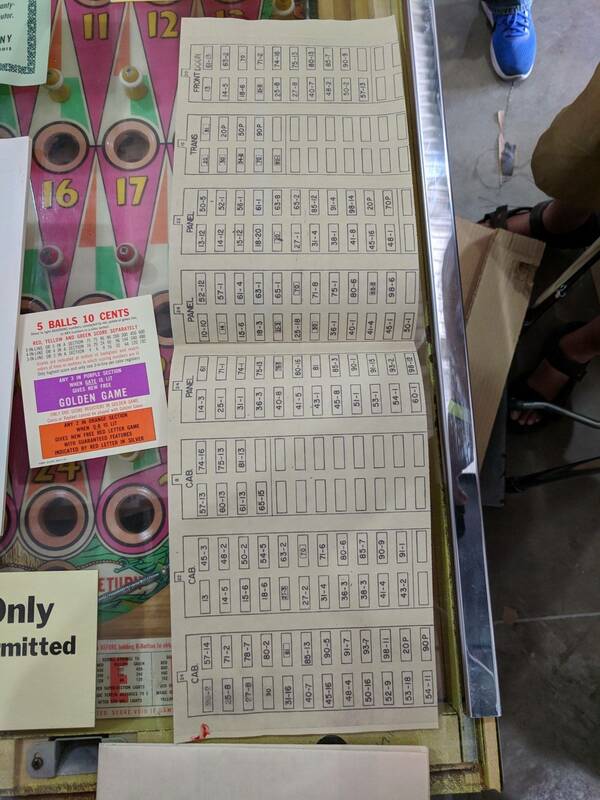 Could this years Bingo Row be the most exciting and important one yet? 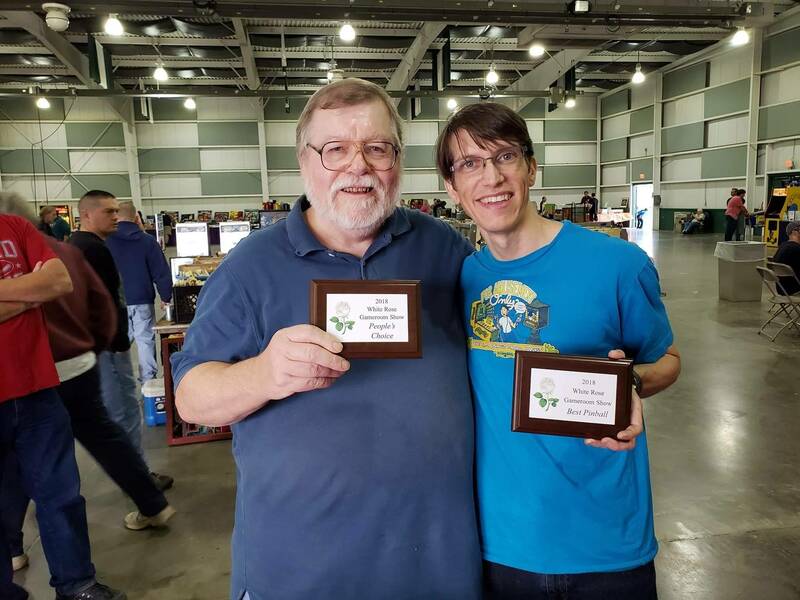 The awards issued to Nick and Dennis are well deserved and both men earn them for sure. 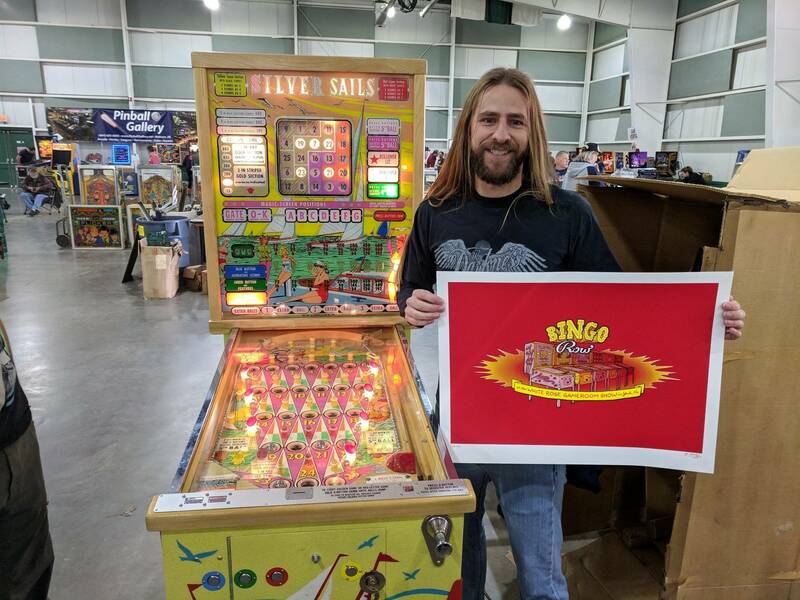 Nick's "one of a kind" Multi-Bingo is an amazing machine. 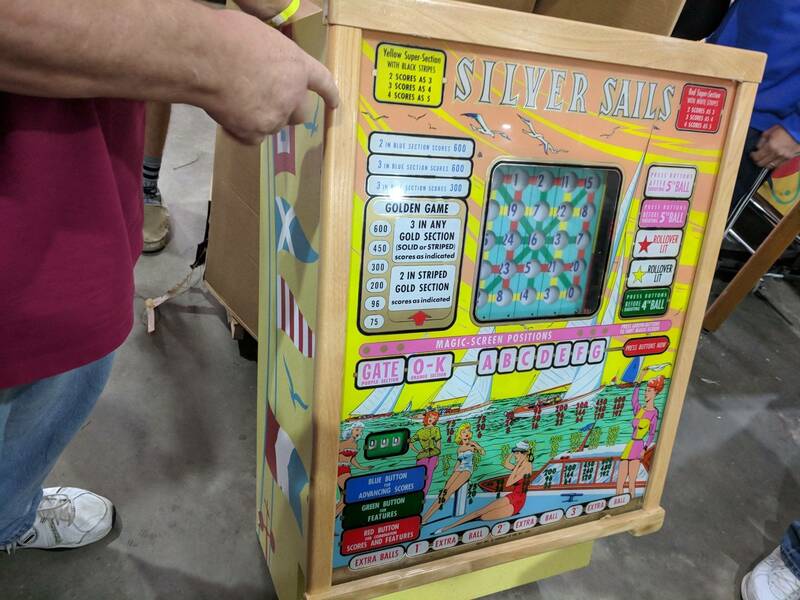 A special thanks goes out to Dennis for sharing his rare opening of the 1961 "new in the box" Silver Sails for all the public to view.... it is a testimony of his love, hard work, dedication and passion for the coin op industry. It was great viewing all the videos and pictures of this sensational event! 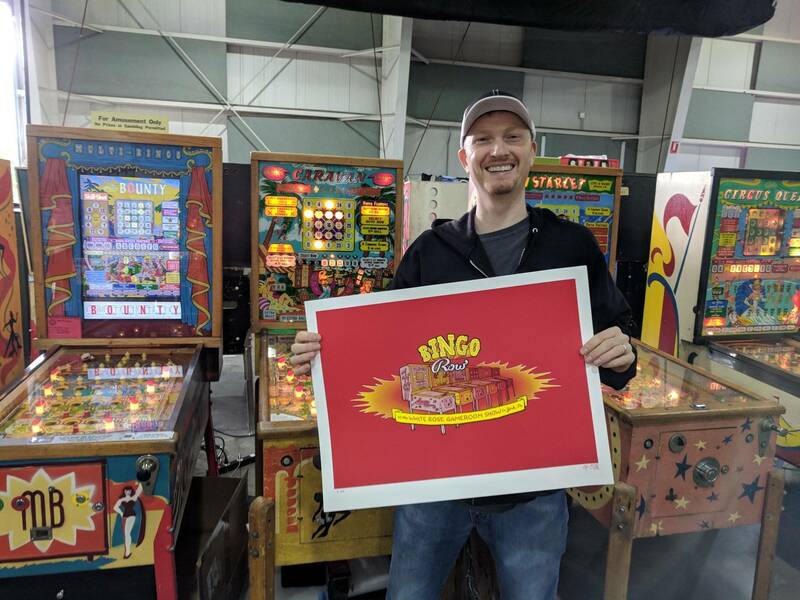 Many thanks for all who participated and were part of "Bingo Row". 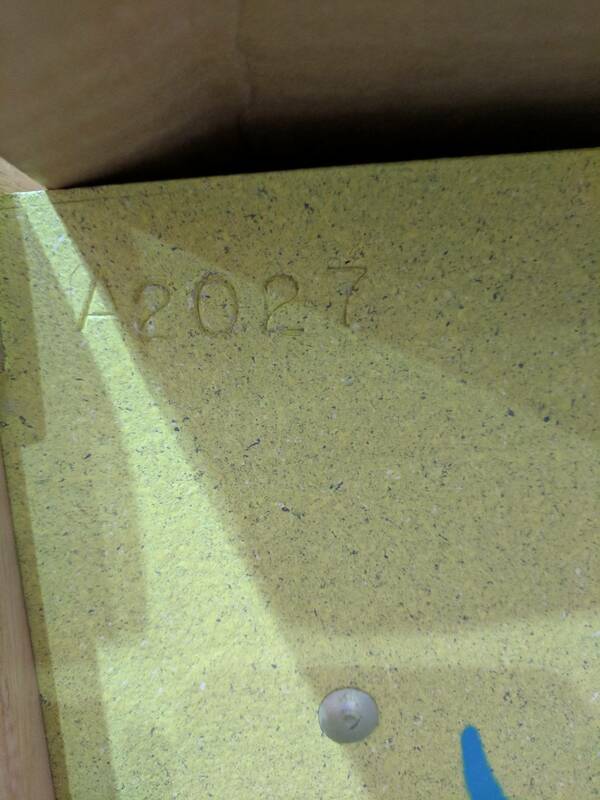 Thanks for the great, detailed photos and timeline on the unpacking of this incredible time capsule. Can you say more about what interventions were needed to make the game playable? Thanks Vic - I'm sorry that you missed it - but hope we'll see you next year! blackcatbone - when the game was first assembled, I hand-tested every unit in the game. 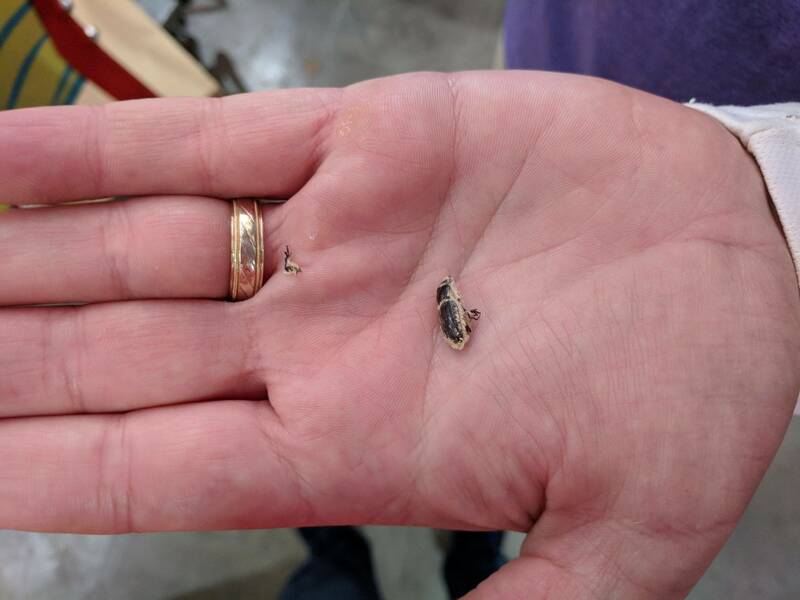 There was concern that the grease inside the motors would have solidified. 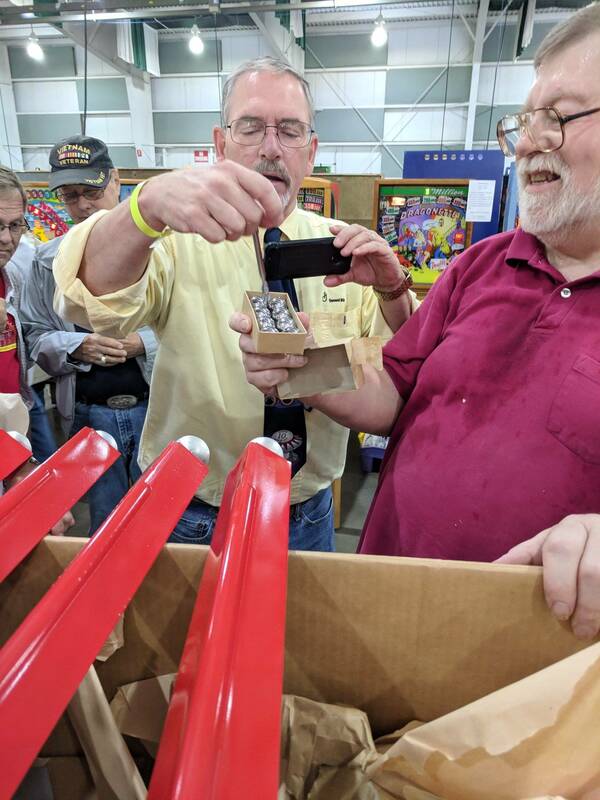 I brought various oils and lube to rebuild as much as was needed at the show, but didn't need very much of anything. The clutches were still freshly lubed (at least from the edges). The units all stepped and reset snappily. The motors moved easily by rotating the fans. 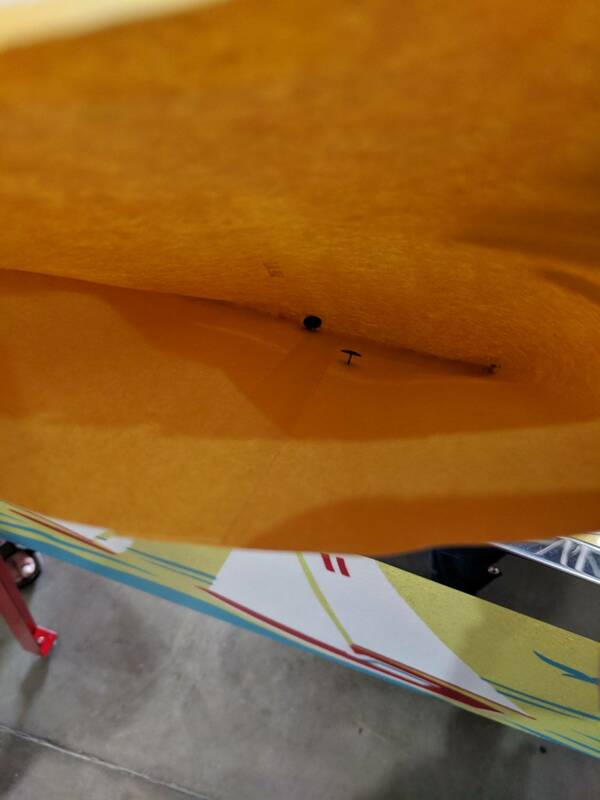 Also, there was slight tarnish on the plugs in the back of the game. 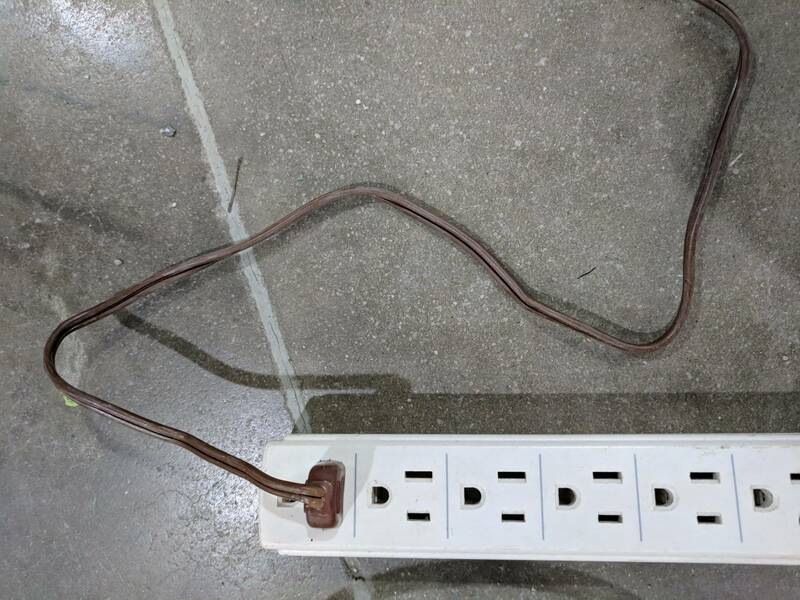 I gave them a few swipes with a Scotch-brite pad just in case before plugging them in. 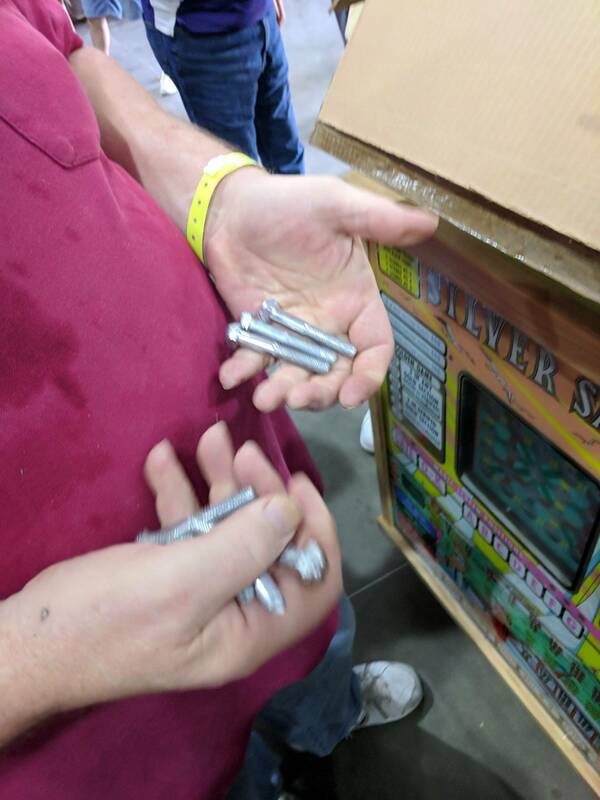 1) Many sockets failed - yes, even in the box, there were some that just didn't want to light. Slight pressure from the back of the game fixed them (temporarily). I suspect a cleaning with a lamp stick will fix them - minor corrosion, probably. I poked the ones that I could. 2) Feature lamps would occasionally die - this was a problem with the fuse holder for one of the lamp fuses. Shimmied it around a little bit very gently and they came back to life. 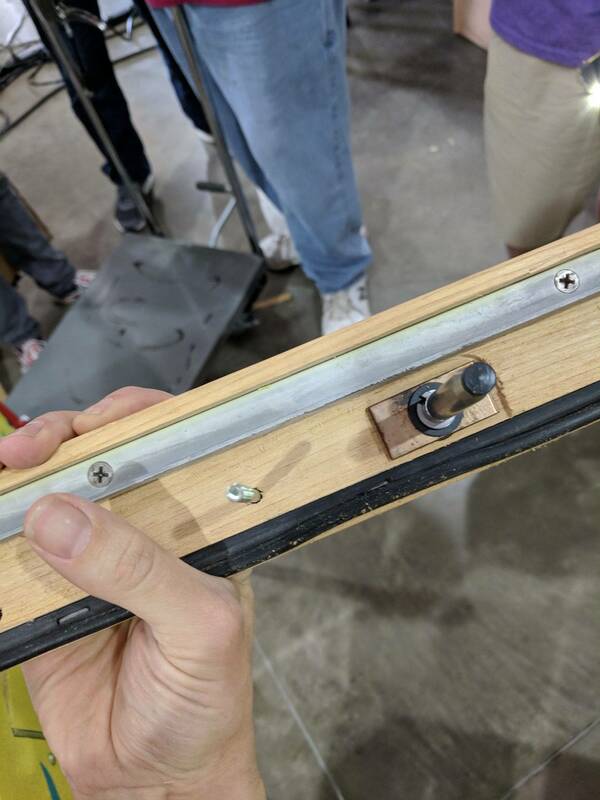 -Slight- pressure on the clips would fix it, but I didn't want to be responsible for breaking a clip, so I just wiggled the fuse as needed. 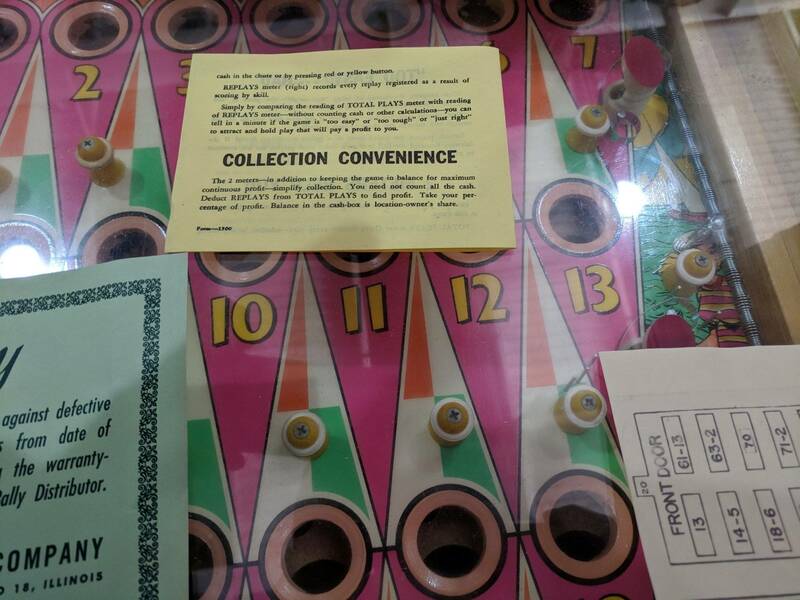 3) OK and Gate games would not pay properly. On the gate, the Sequence Unit would lock on. I played the second game on it (I still can't believe it! ), hit the purple and held R - the sequence unit locked at max. Nothing else appeared awry, so I reset the unit and tried again - same deal. Hit the position #33 relay (thanks for that okorange - I would have never remembered that in the moment), and it started without incident. That was its first sectional pay, so I wasn't surprised that it would fail. Over the course of the show and about 4 more sectional wins, the problem was resolved. But not before one pay when I was across the row, and the Sequence Unit step coil locked on. Smoked, let it cool down, and it was fine (thankfully). After that it was fine. Gate paid fine, but OK would occasionally have a problem due to the next issue. 4) Selection Feature Unit needed to be rebuilt. Out of all the steppers in the game, this was the only one that was sluggish/unresponsive. Normally, it doesn't make a big difference, and if you are locked into After 5th, it just gives most people a better chance at winning, so it was left alone. I put a dab of PBR grease on it and worked it back and forth, but only slight improvement was noted. Because it wouldn't reset, OK games didn't pay properly. 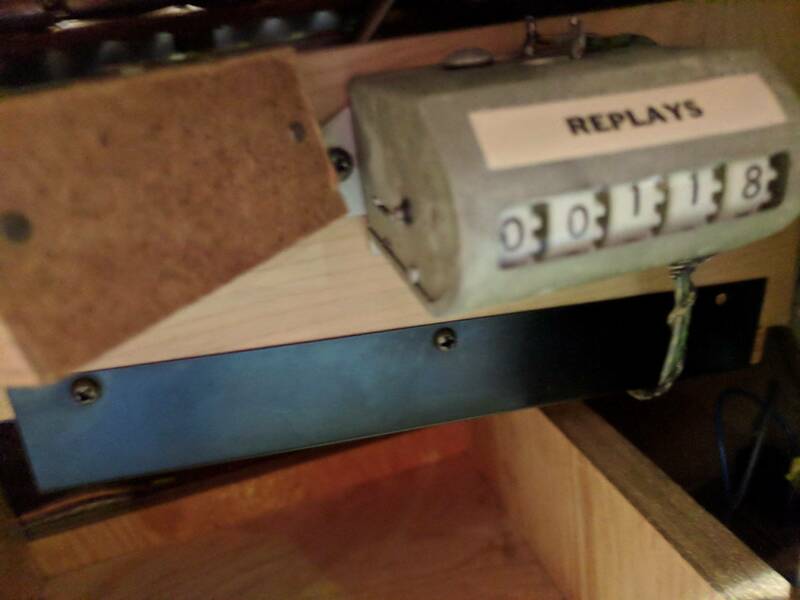 Not a huge deal, I just had to open the Position 29 relay. Bigger deal was that I needed to be near the game. The majority of my tutorials were on that game after the smoking coil, so not a huge deal. 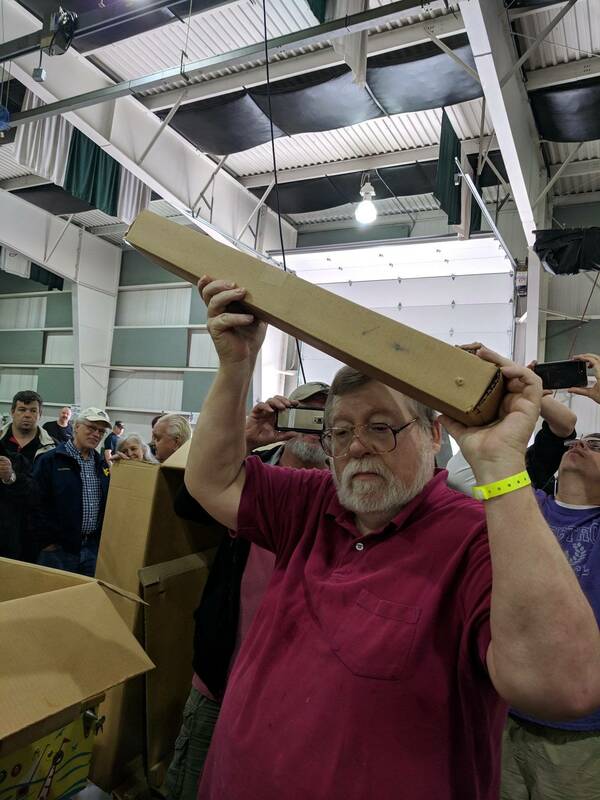 In order to fix this, I would have had to pull the glass - probably not wise at the show, but I advised Dennis. 5) I did put some motor oil in the bearing fill tubes, careful to wipe up any excess drops on the tubes - just in case the bearings were a bit dry. Might have been overkill, but it certainly didn't hurt. Especially with the game being run as hard as it was all weekend. 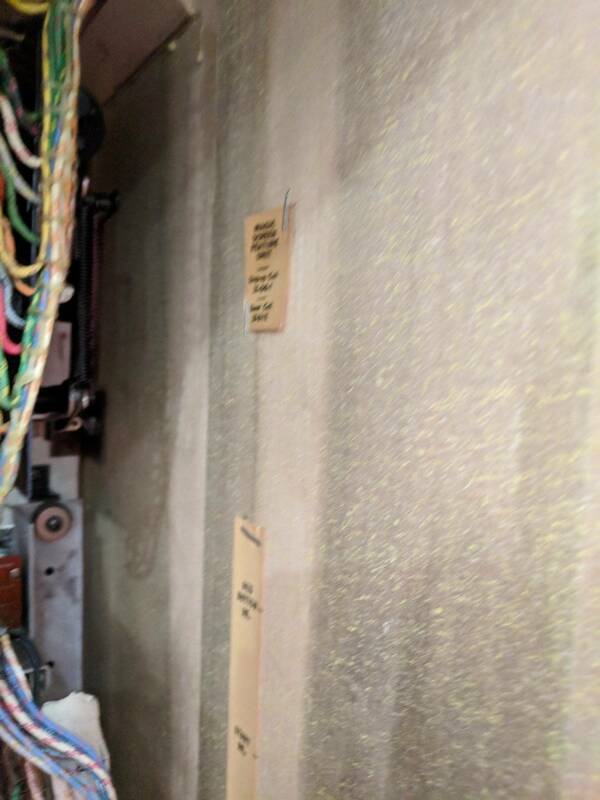 I observed frequently the workings to ensure that clutch fibers were not flying up into the machine on timer cam/mixer latch release. I believe the clutches to be in perfect order. And Vic, you said it! 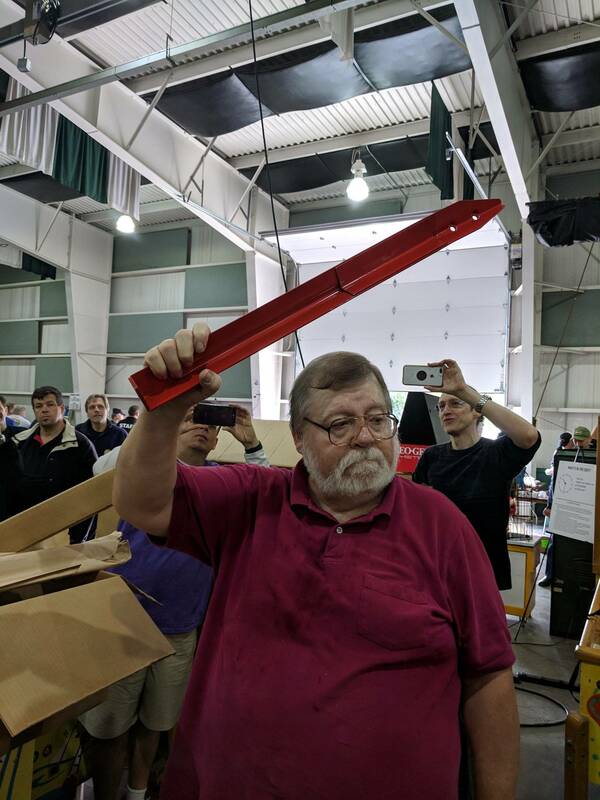 What a gift for Dennis to bring this out for the public to see and play. 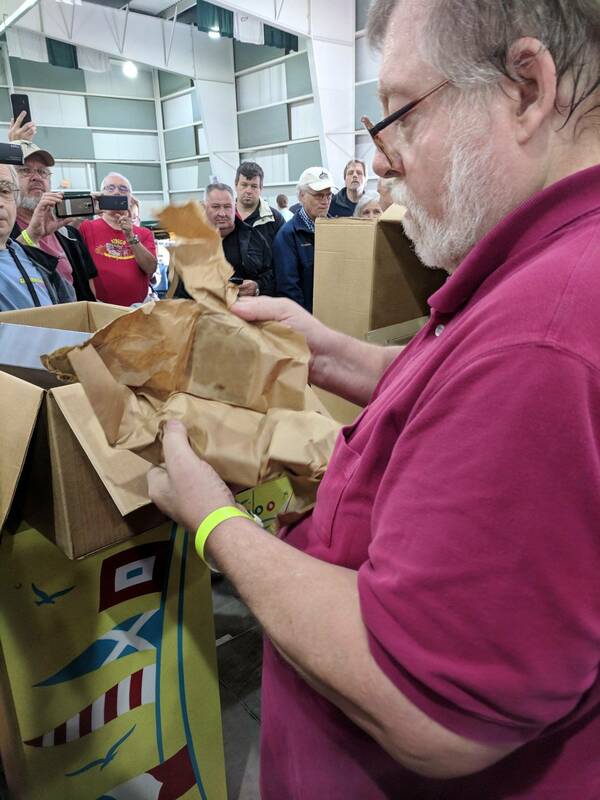 I've never seen anything like it, and am still in awe of both the game and his generosity. 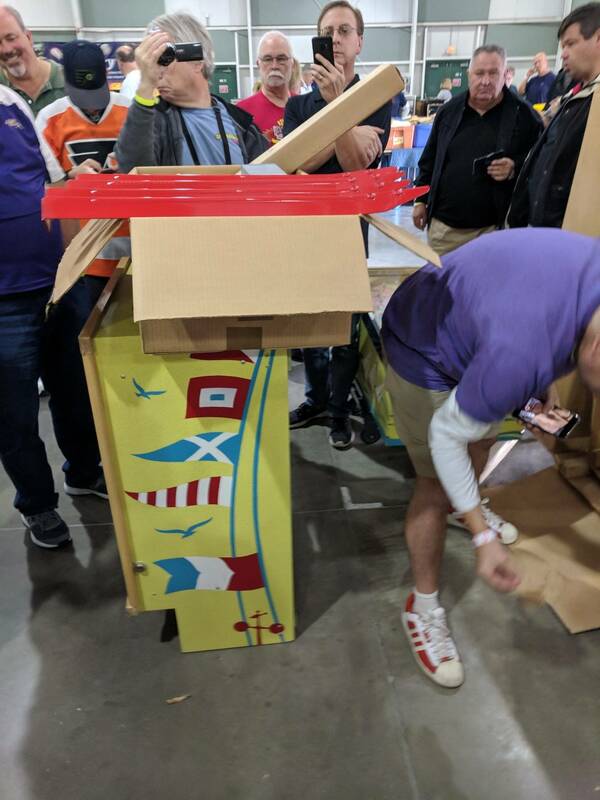 A great big thank you to everyone who helped make the box opening a success. None of this would have been possible without the help and promotion from Nick. I am indebted to you for life. Finally getting to play the Multi was a highlight. It's even better playing than I had imagined. 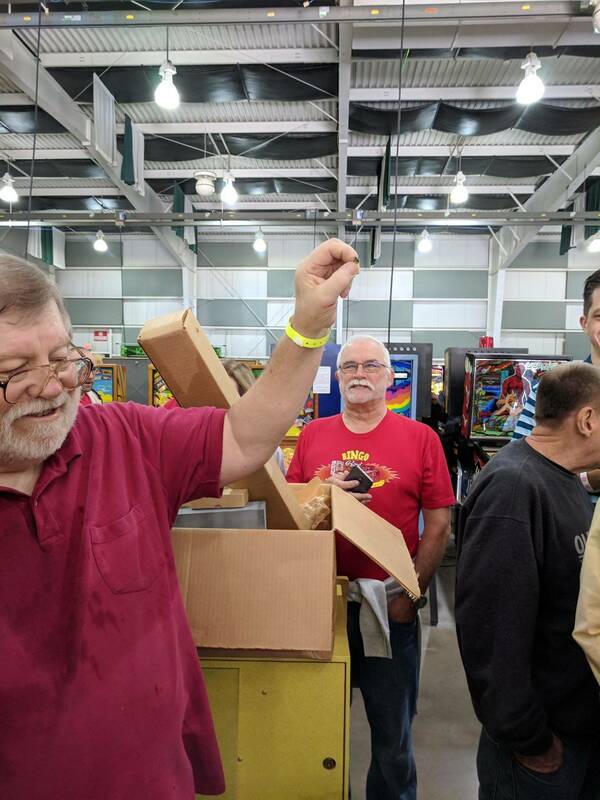 And then for you and the Multi to win the top pinball award and the Silver Sails winning the People's Choice award (the only two PINBALL awards at the show!) is just amazing! 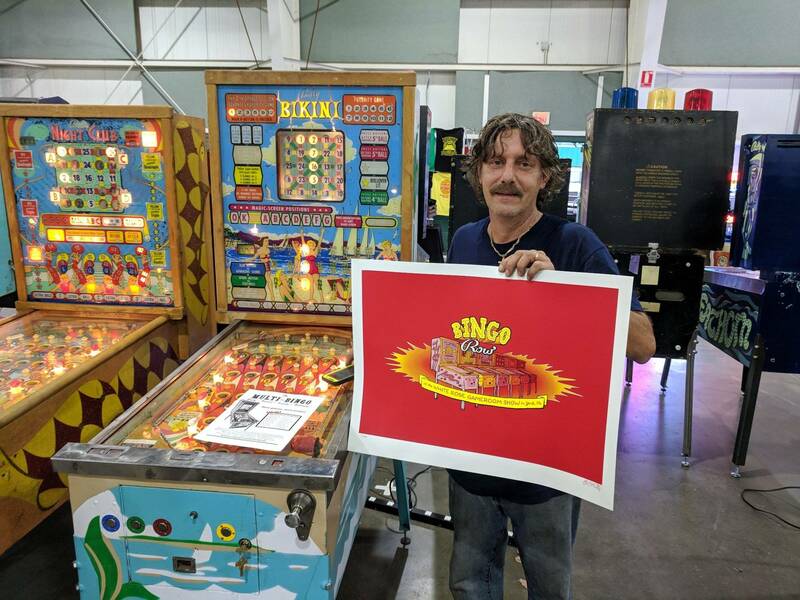 Thank you, thank you Nick for everything you do to help keep bingo enthusiasm alive. The future is in good hands. Thanks also to the show promoters and staff. 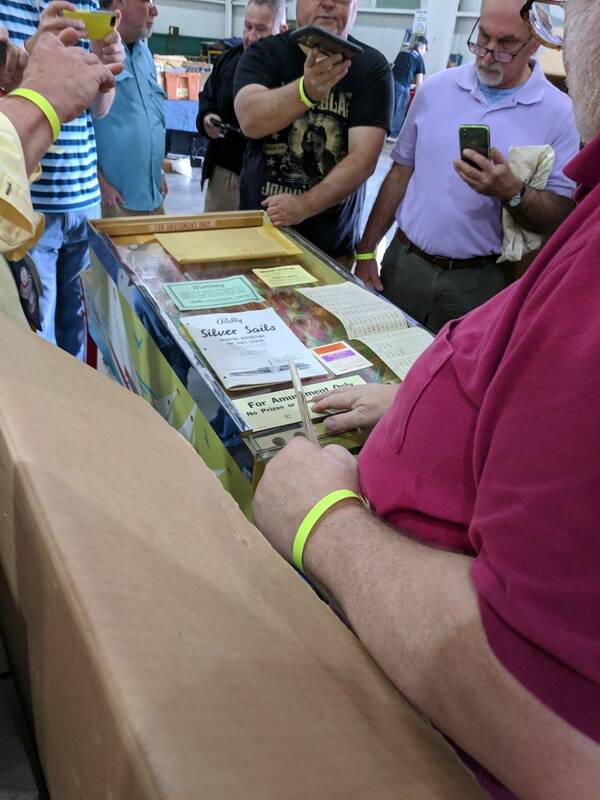 This was my first time at the York show and I was amazed at how smoothly everything ran. A special thanks to my best friend Jon Mueller who is always there to help. He's also a great co-pilot on the road. 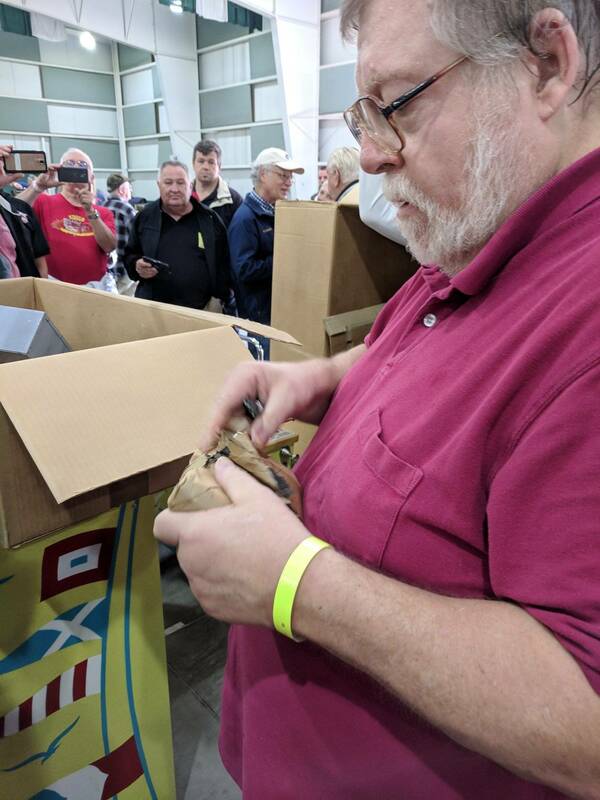 Thanks also to all of the great bingo guys who attended the show and helped with the box opening. I'm sorry I can't remember everyone's name but it was a great turnout. Many, many photos and videos were shot and I hope to see all of them. 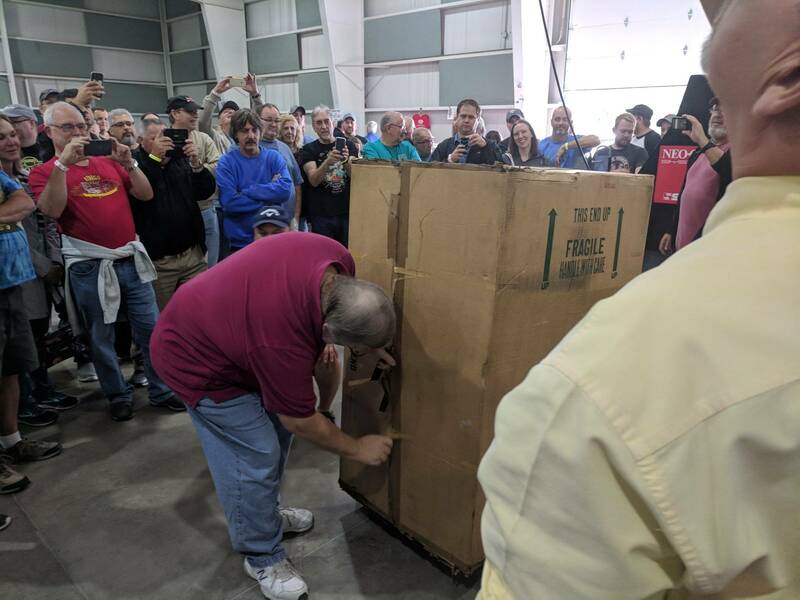 Thanks to everyone who recorded the event, especially Steve Smith who seemed to be actually crawling through the box to capture every little packing detail. This will help greatly for future historians. I believe Steve was the person responsible for turning Nick onto bingos so we certainly thank him for that. Steve also owns the only bingo necktie that I have ever seen. All of our questions were answered and I think Nick has covered most of that. Unless you were there, you cannot appreciate just how nice the condition of the game was. It actually still smells new! And then to set it up and have it mostly working?! Unbelievable. 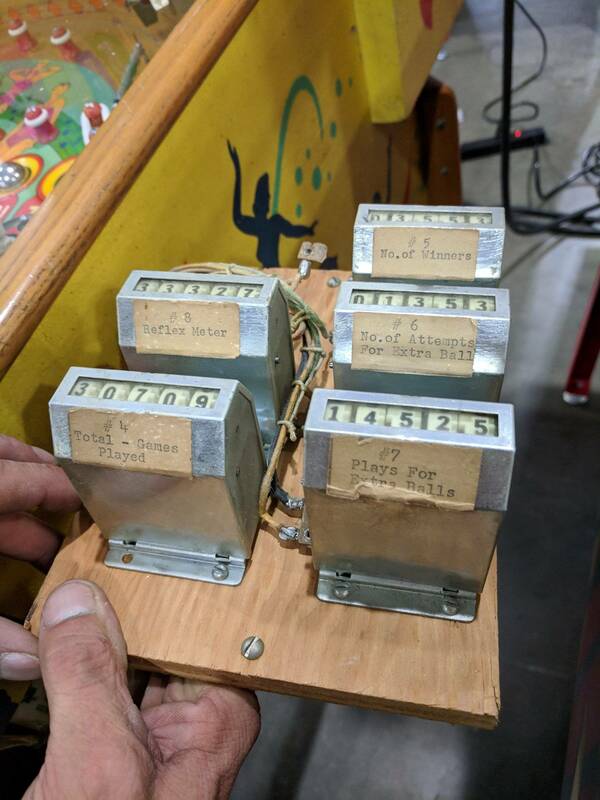 Thanks to Bingo Butch and Mike for bringing the only known example of a United Serenade bingo that was only discovered a few years ago and never known to exist before that. A strange game for sure. 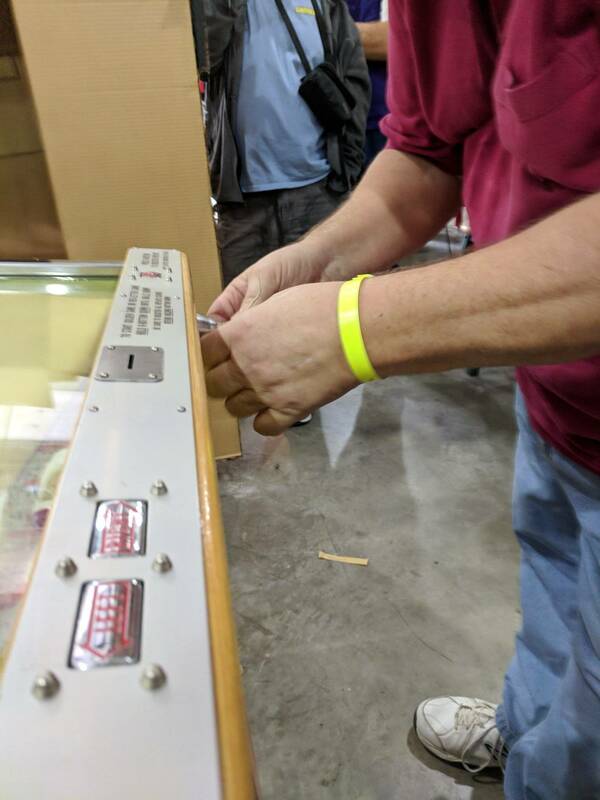 Also thank you to Ryan Claytor for bandaging up my bleeding hands after I discovered that Bally shipped their playfield plate glass without smoothing out the edges! I bled all over the paperwork envelope for the game. Thanks again to everyone who attended the show. 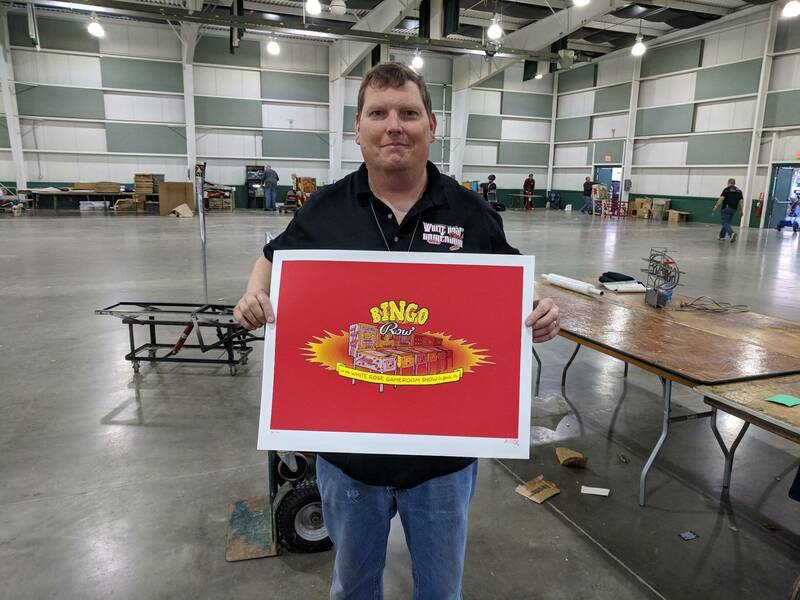 Looking forward to the Texas show where Nick may possibly bring the Multi-Bingo and Shawn Farwell is hoping to have the acrylic Golden Gate bingo up and ready for play. I was going to list the audits on the game but it is over at my son's home. 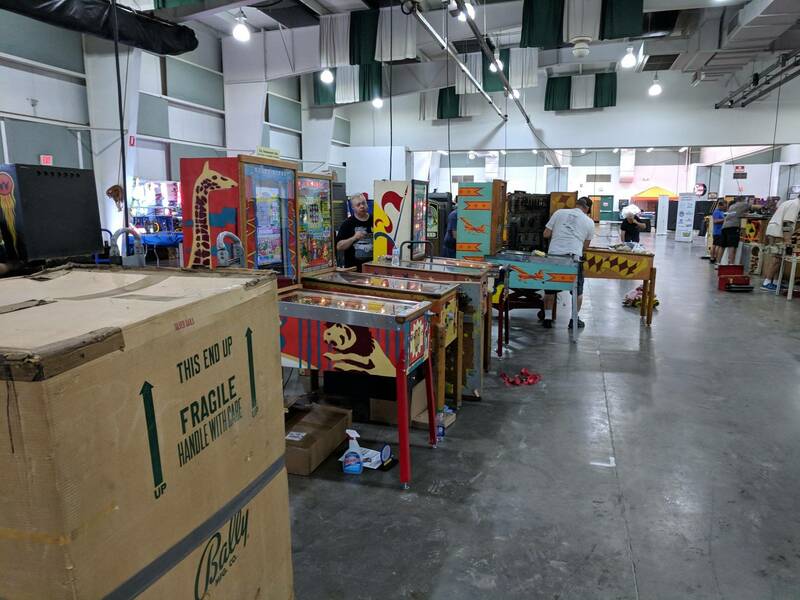 I think there were about 118 games on the counter from the factory and something like 600-700 on the game after 2 days of play. I'm curious about the red plastic ball hood near the shooter. Did Bally stop putting their logo on the ball hood at some known date, or was the use of the unmarked ball hood sporadic throughout the bingo era? 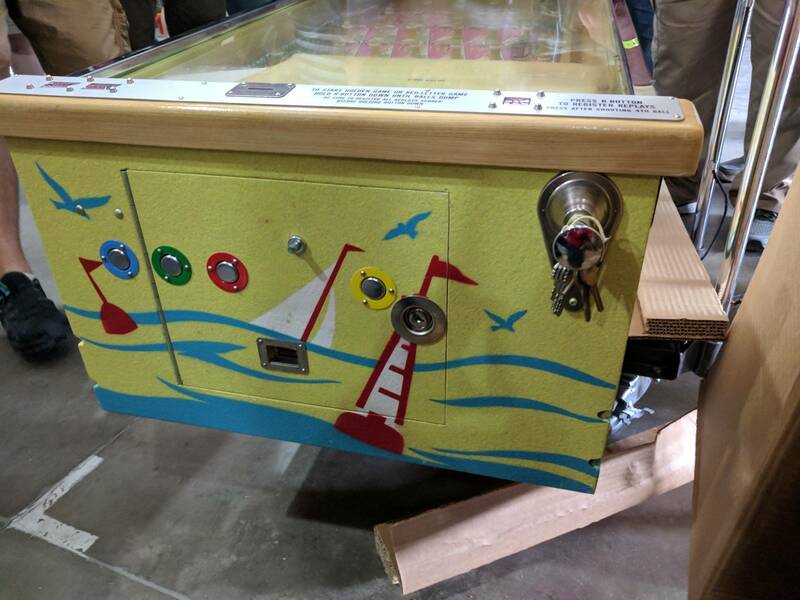 I hadn't noticed before, but the Bally logo also is missing from the backglass. 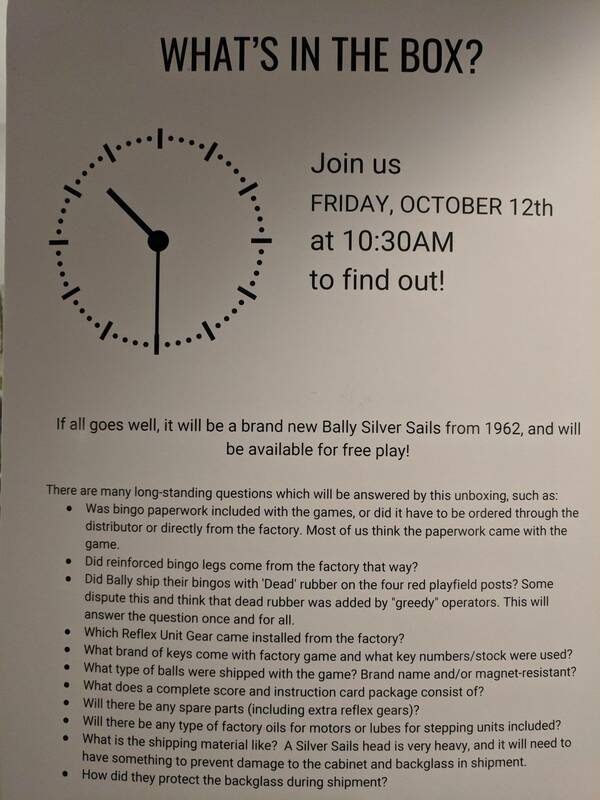 I wonder if this was done to lightly disguise the game's origin as the Bally factory. Anyone know or have a theory? It's like you buy a Ford and it has no Ford badge on the hood. Couldn't have gone to a better group of folks, great guys all of them. Congrats on a really family friendly, laid back, and well run show. 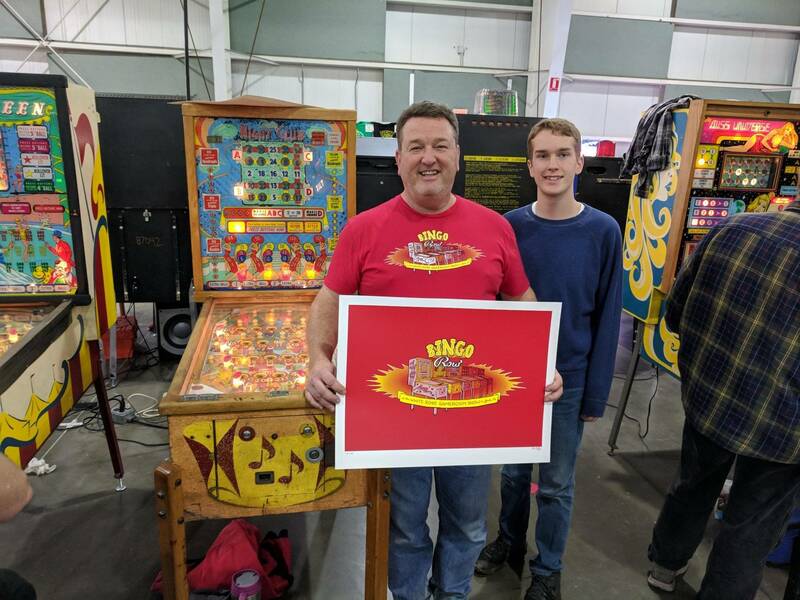 Truly a pleasure to see, and highly recommended for those that love pinball of all kinds and folks that are down to Earth and do it right with family in mind. Nick, great stuff, Dennis super nice of you to pass the torch and bring the treasure for all to see, play and remember. Amazing thing for you to do. They definitely did, but I don't know the exact date - I believe it was around the changeover to metal rails, which was only a few years prior to this. Someone else may know for sure. 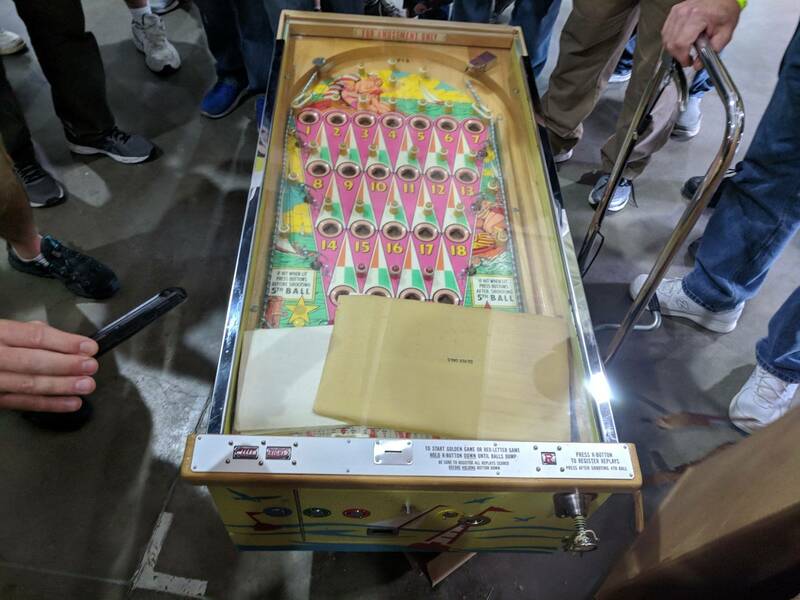 I hadn't noticed before, but the Bally logo also is missing from the backglass. I wonder if this was done to lightly disguise the game's origin as the Bally factory. Anyone know or have a theory? Interesting, isn't it? It does have Lion Manufacturing down near the bottom of the glass, so I'm thinking it's more a crime of omission rather than commission. My guess, based on the layout of the backglass, is that there just wasn't space with the super section lights right beside the title. I am indebted to you for life. Dennis, that absolutely goes both ways. I could -never- have completed, or even started, my game without all of your help. A special thanks to my best friend Jon Mueller who is always there to help. 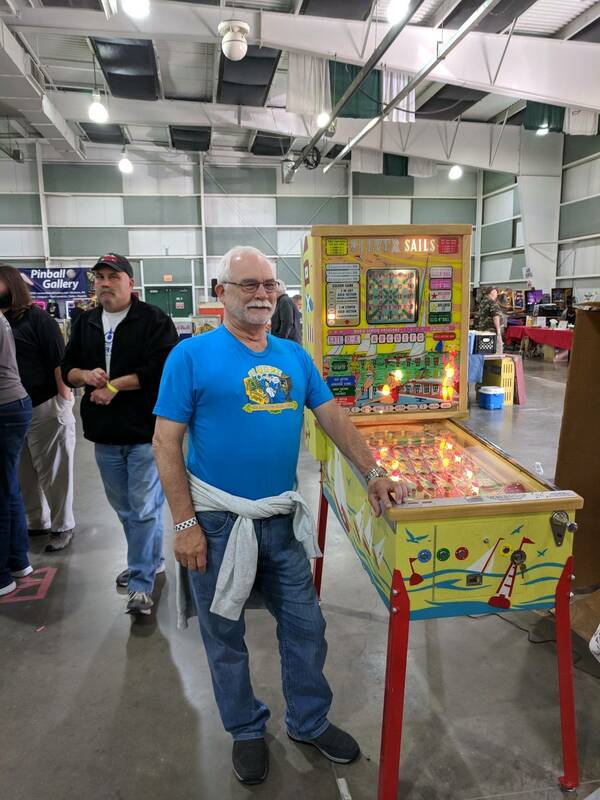 I am very thankful to have met Jon as well - you both were instrumental in the Multi, and I am very pleased that he was able to make the trip to the show. I did a writeup on Facebook and meant to post it here with the questions and answers. I will do so shortly. I look forward to seeing that when you have time! Nick...who brought the Bally Night Club? Was that your game? That was Jeffrey Lawton's game. The first Night Club I played - the one that hooked me on Magic Squares. My Night Club now resides in Canada! Dennis played the first game of course. 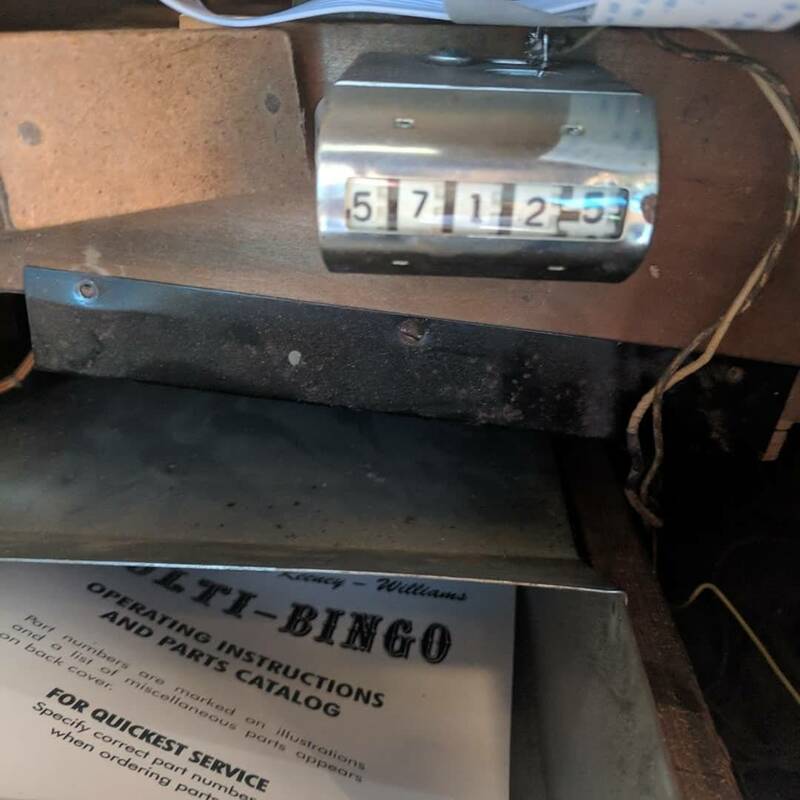 Your's truly played the third (they warmed it up for me) .. BLAMO, the "First Winning Hit" on Dennis' N"O"B bingo. 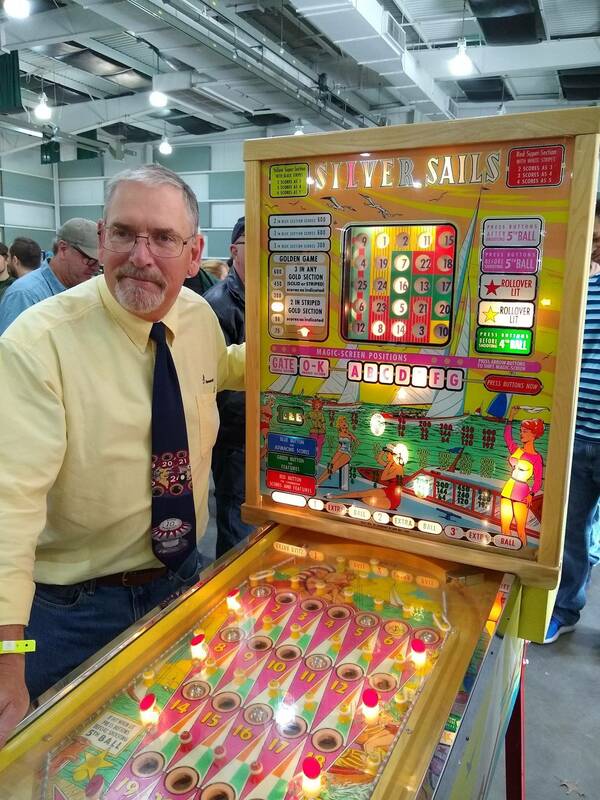 (during the first public appearance of the only known "Bingo Pinball Necktie"). It was really great to see you again, and you sure looked suave in that shirt and tie! Steve...."You look Marvelous" in that shirt and tie and color match the NIB Silver Sails perfectly. 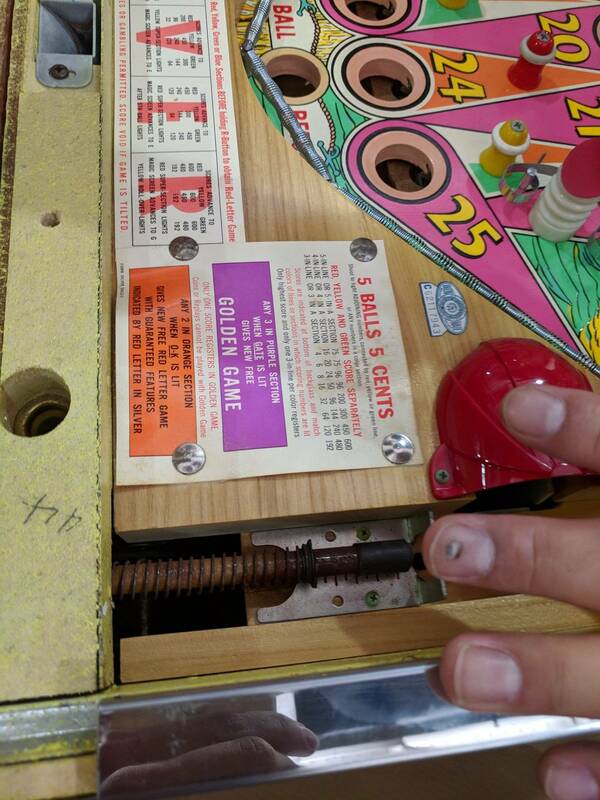 I search around on bingocdyn and couldn't find what playfield game is printed on your tie. Can you tell me? Is it a Bally or United? 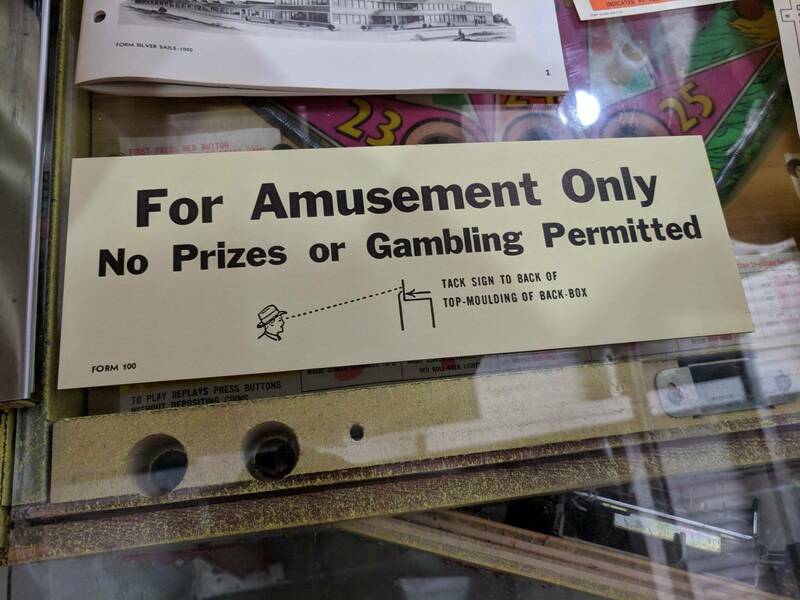 I am thinking 1950's bingo? Hi Vic ... Missed you matey. Thank you for the kind words (and you too Joe!!). And yes, I picked that shirt on purpose. The tie sports the dead bumper section of Bally's Miami Beach's playfield. When folks asked about it at the show I told them I bought it about 10 years ago. Upon reflection it was12 or 13. Bought it off an obscure website which showed the tie, mentioning there's "One in Stock" (which I bought). The label on the back says Corvette. Thinking it can't be the only one in the world ... but ... ?? 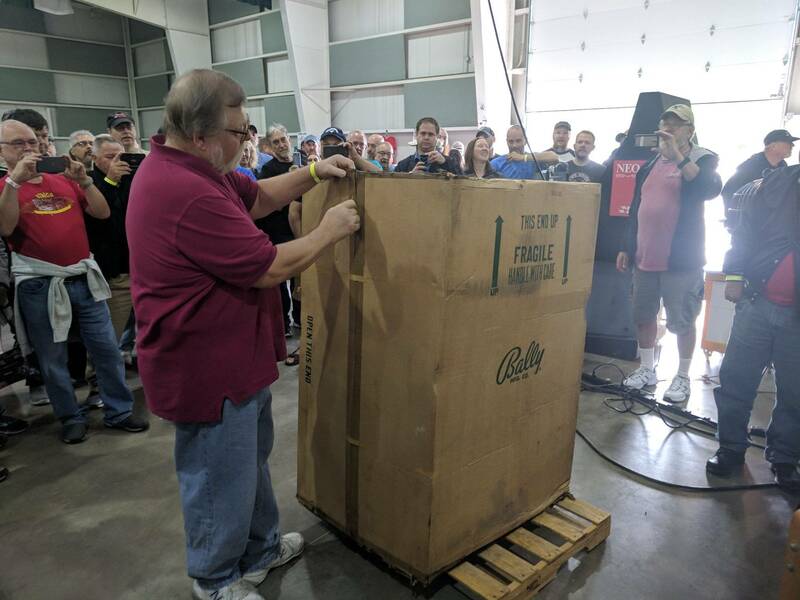 My video of the Bally Silver Sails unboxing. Nice job! Thanks for taking and posting this. 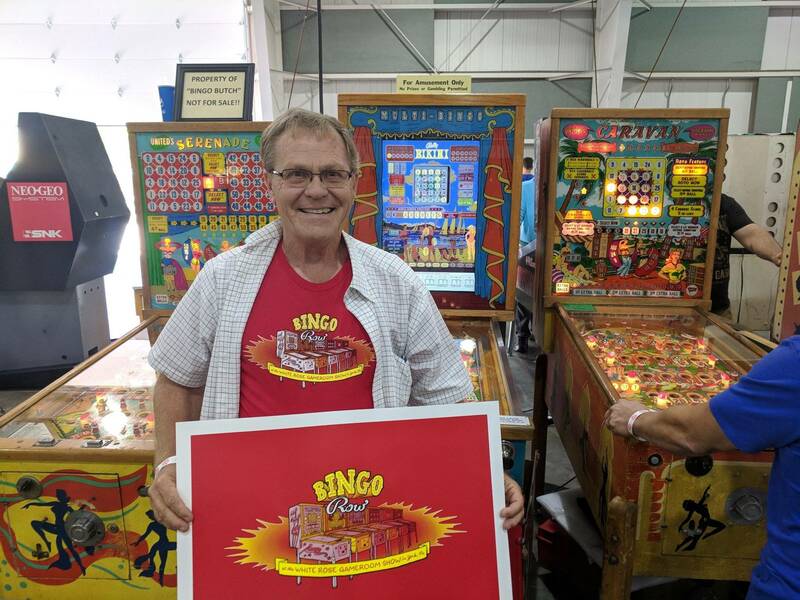 I should have known it was the founder and originator of Bingo Row....the one who started it all at the York show many years ago. 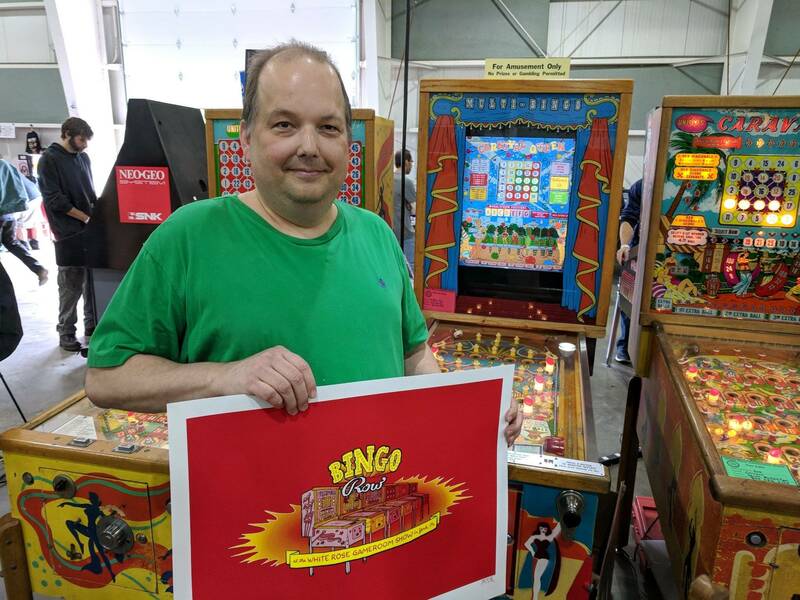 Thanks Jeffrey for all you've done for the bingo hobby and for bring your Night Club for all to play and enjoy. Finally saw this topic thread. Cool beans. Fantastic.